Rimpex Rubber supplies CNC Engraving Machines from China. China engineers have integrated CNC technology, engraving CAD/CAM technology, high precision engraving machine design technology and small tool engraving process into the production of CNC engraving machines. Rimpex Rubber is not manufacturer of CNC Engraving Machines, however, we would guide customers only to the exact manufacturer of these CNC Engraving Machines. Rimpex Rubber is close partner of this CNC Engraving Machines manufacturer for international market. 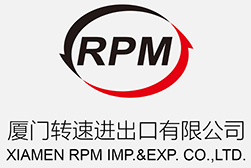 Rimpex Rubber offers Chinese articles listed in above links which are talking about CAD, CAM, CNC to Chinese readers. 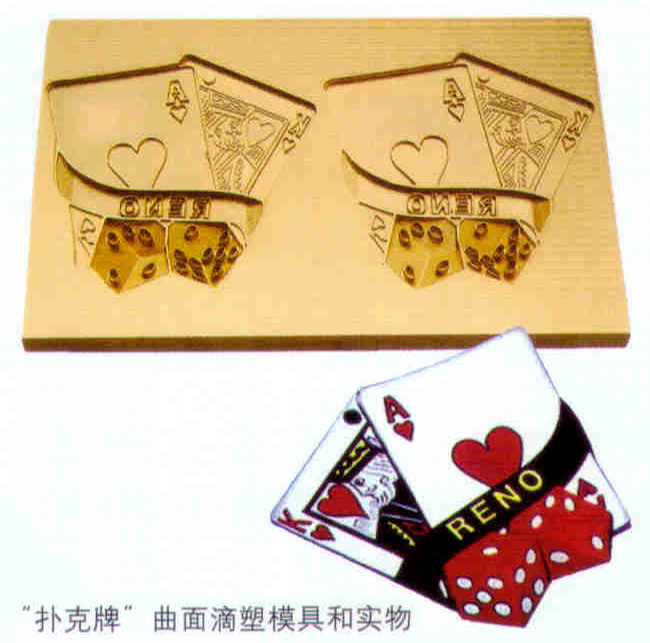 These articles will help visitors to know better on CNC Engraving Machines. 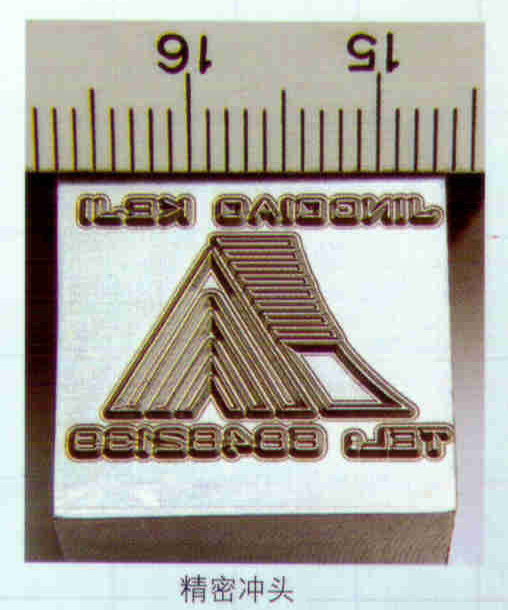 "CAD/CAM Software" Controling "CNC Engraving Machines" With "Small Cutting Tools"
JDPaint Software is a basis component of CNC Engraving System. JDPaint Software is a pioneer and professional CAD/CAM domestic software especially designed and developped for carving industry. JDPaint Software has been updated to the lastest 5th version recently. It enhances many function modules such as operation flowchart, operator interface, graphics compilation, art sculpting, surface sculpting, CNC Engraving, etc. JDPaint Software not only breaks through major carving design and machining technology on surface relievo, equal cutting but also realizes easy operation and practicability of CAD/CAM software which enhances the processing capacity of CNC Engraving Machines and expands application fields of CNC Engraving Machines to more industries. 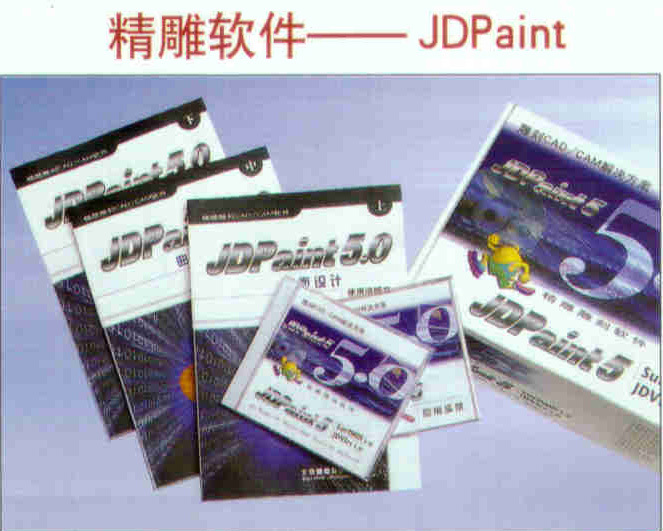 JDPaint5.0 is a software fully with China Independent Intellectual Property Rights. It comes from more than ten years' experiences on CNC engraving and latest carving technology with China engineers' hard work. It also make full advantages of feedbacks from JDPaint's customers. Now JDPaint Software could bring CNC Engraving Machines into machining incisively and vividly. CNC Engraving Machines are made up of engraving machine body, control chip, control cabinet, control software and other related fittings. 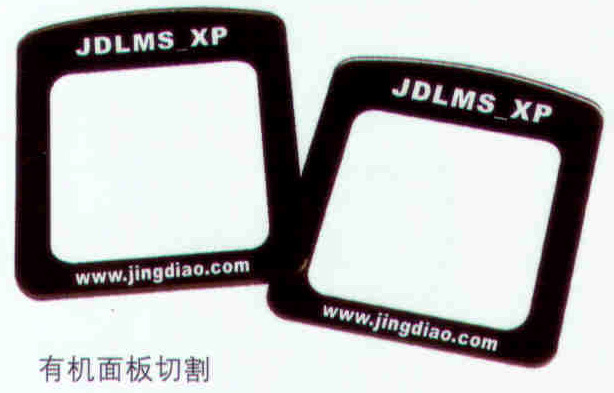 CNC Engraving Machines are working following processes and methods marked out by JDPaint software's programming. CNC Engraving Machines currently have 8 series 22 models machines working for industrial moulds, environment artwares, professional products with its high efficiency, precision machining. China CNC Engraving Machines are surely your preferred machines. Minitype Complicated Surface, Art Relievo Surface, etc. 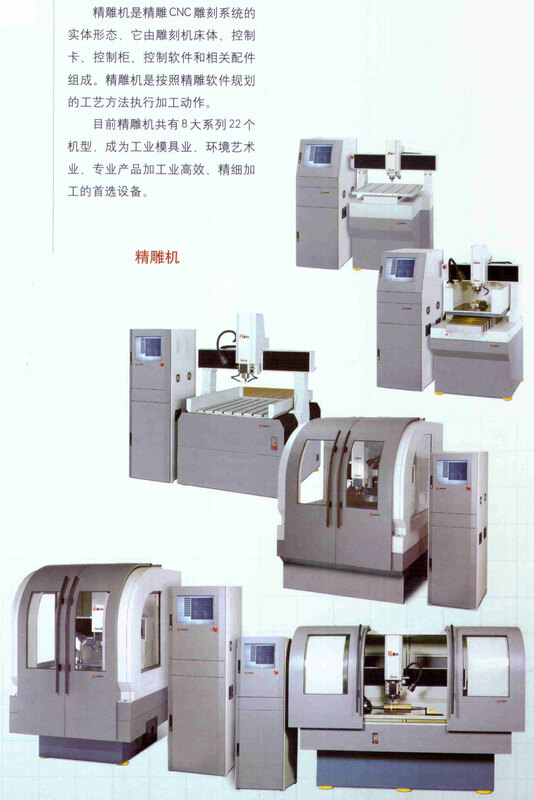 ◇ CNC Engraving Machine Carver Series are put in market in 2004 for high standard precision industry. ◇ CNC Engraving Machine Carver Series have great improvement on structure, figure, performance. ◇ CNC Engraving Machine Carver Series have rather good stability especially on machining products of high precision, high requirements. So it is propitious to customers for mass production. ◇ CNC Engraving Machine Carver Series are suitable for machining of precision products, copper electrodes, precision die moulds, bronzing moulds, plastic dripping moulds, hot cutting moulds, mould lettering and minitype injection moulds. Especialy for machining those products with requirements of high smooth finish, such as copper electrode, CNC Engraving Machines have excellent performance and behavior. ◇ CNC Engraving Machine Model Carver 280 is a standard one suitable for precision mould's machining. 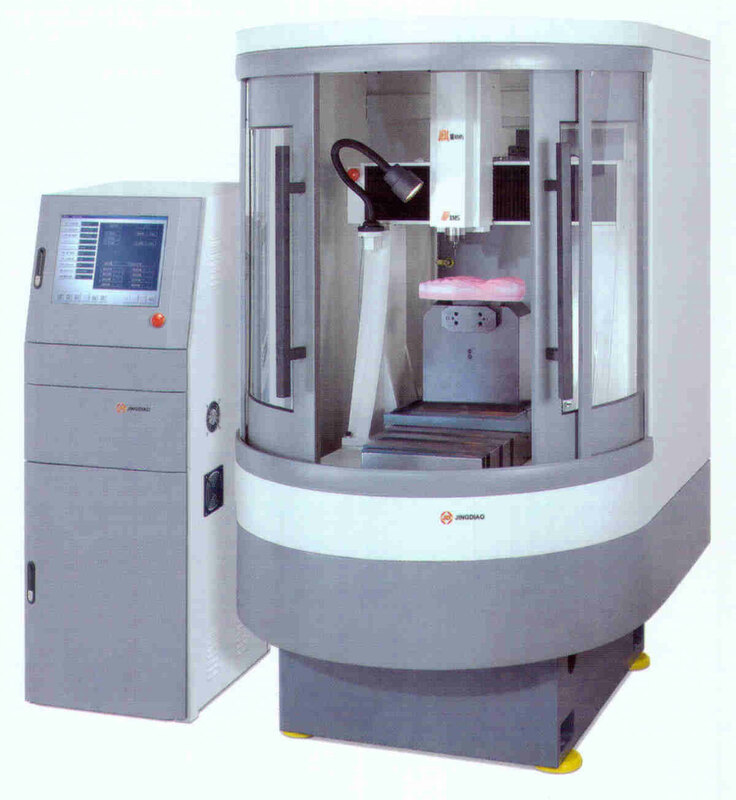 ◇ CNC Engraving Machine Model Carver DZ is a machine with dual machine heads suitable for moulds' batch machining. It has two machining methods, one is single working procedure for dual workpieces, another is single workpiece dual working procedures. Axis Z could be solely controled independently working. 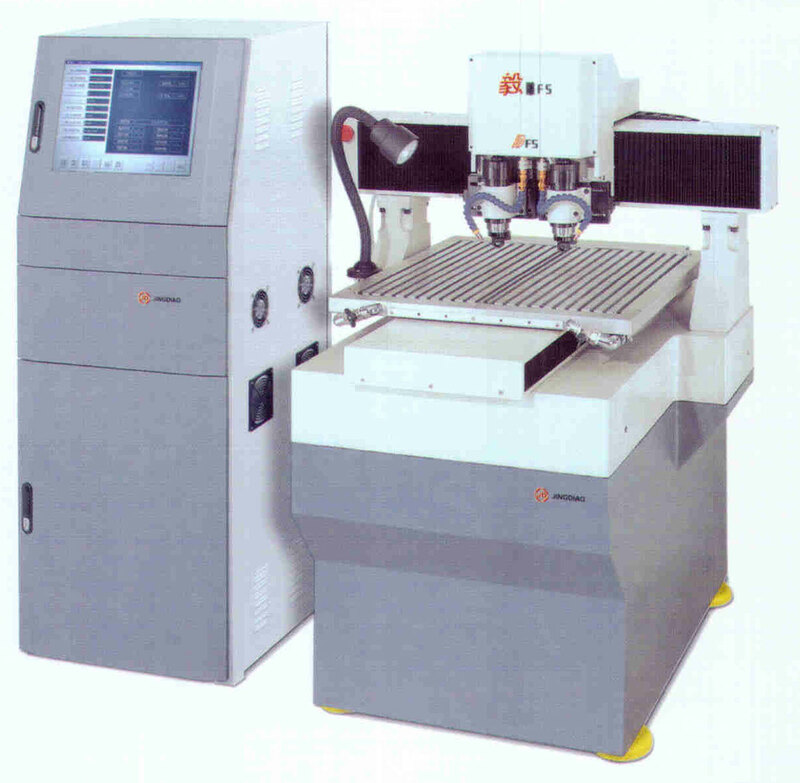 ◇ CNC Engraving Machines have two kinds of main axis electric machinery. One axis is with diameter 62 at maximum rotate speed 24, 000 rpm which is suitable for minitype cutting tools' precision machining, another axis is with diameter 80 at maximum rotate speed 20, 000 rpm, 1.2KW which is suitable for diameter 4 cutting tool's machining. 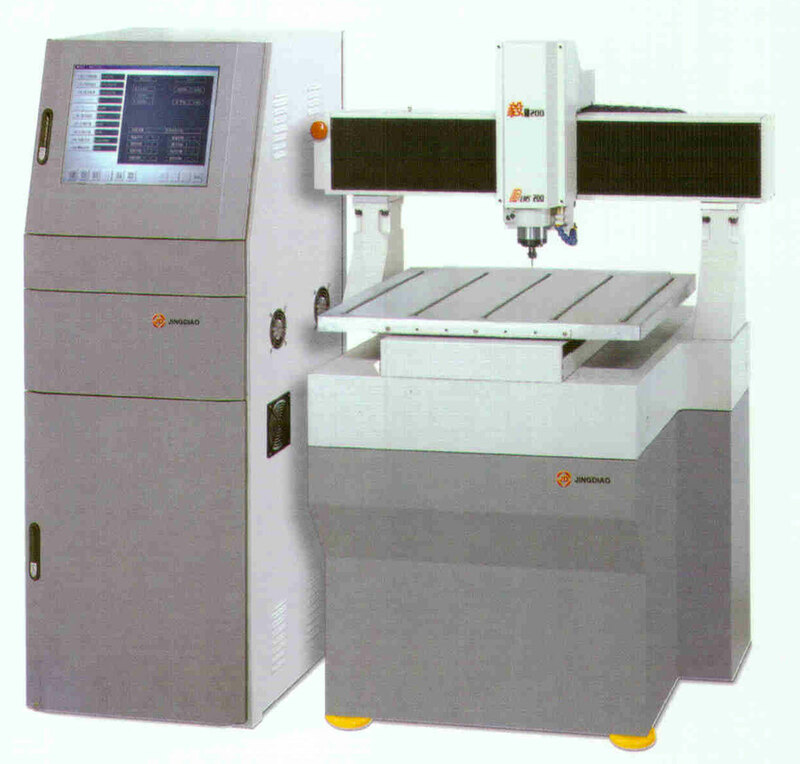 Remark: The above precision parameters are measured by Renishaw Dual Frequency Laser Interferometer and Ballbar. ◇ CNC Engraving Machine Model PMSG is rather salable machine due to its high machining precision, low usage cost, high machining efficiency for high precision products, legerity structure, convenient operation, good performance/price rate. ◇ CNC Engraving Machine Model PMSG is especialy suitable for small mould manufacturers with high requirements on machining. ◇ CNC Engraving Machine Model PMSG is suitable for precision products, copper electrodes, precision die moulds, bronzing moulds, plastic dripping moulds, high frequency moulds, hot cutting moulds, small moulds' lettering and minitype injection moulds' machining. 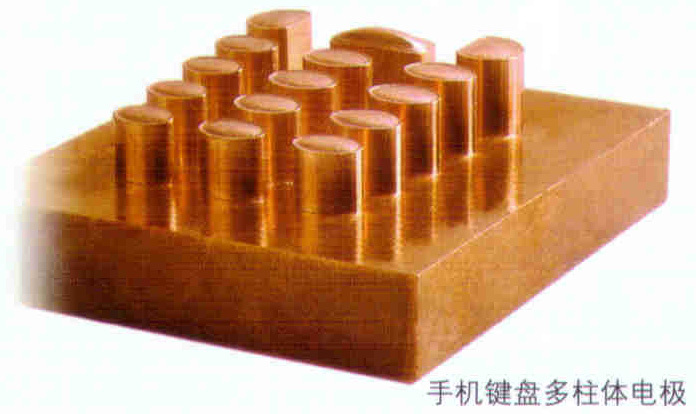 ◇ With reasonable processing conditions, for machining copper, Cr12, cuprum 59 materials, the finished products made from CNC Engraving Machine Model PMSG could have sizes' precision as ±0.04mm, surface roughness degree as 0.8um; while with strict processing conditions, the finished products made from CNC Engraving Machine Model PMSG could have sizes' precision as ±0.02mm, surface roughness degree as 0.4um. ◇ CNC Engraving Machine Model EMB is an economic equipment with stepping drive system. Compared with model PMS, CNC Engraving Machine EMB is in the shade on machining precision, machining efficiency and machining stability. ◇ Being economic model, CNC Engraving Machine EMB has wide application fields at the beginning of application of CNC Engraving Machines in China market. ◇ However, in the movement of higher and higher requirements on products' precision, especially that moulds have higher and higher requirements on the smooth finish of machined underside in order to improve polishing precision. CNC Engraving Machine EMB could not meet with the market requirements of "High Precision, High Efficiency" due to its low cost stepping driving system. ◇ CNC Engraving Machine EMB is most suitable for high frequency moulds which have not so high requirements on machining precision. ◇ The 3 axles driving of CNC Engraving Machine Model XMS adopts AC servo system. ◇ CNC Engraving Machine Model XMS adopts little sections Ray Aligning Technology which could get high average machining movement speed and high machining efficiency. ◇ CNC Engraving Machine Model XMS is a professional machining equipment especially for shoe sole models which are mainly ABS materials. With professional clamp tools, CNC Engraving Machine Model XMS could machining 5 sides of shoe sole mould and the sides' connection precision is within ±0.1mm. ◇ CNC Engraving Machine Model HMS is the most solid and well-knit one among our machines. That is why its output power of spindle motor is 2.2KW. With reasonable process methods, it could adopt cutting tools with diameter 6 for some rough machining. ◇ And it is because that CNC Engraving Machine Model HMS has axle with diameter 120mm at maximum speed 18000rpm only that limit its small cutting tools' precision cutting capacity. ◇ The most suitable machining fields of CNC Engraving Machine Model HMS are refining large steel moulds, machining aluminum alloy moulds and roughly/subtly machining nonmetal materials. ◇ CNC Engraving Machine Model HMS has 3 specifications as HMS280, HMS350, HMS480 whose main difference is the different feed heights. --The feed height of CNC Engraving Machine Model HMS280 is 280mm which is suitable for machining high precision products. 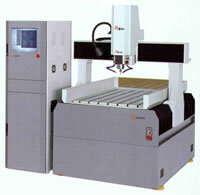 --The feed height of CNC Engraving Machine Model HMS350 is 350mm which has standard configure. --The feed height of CNC Engraving Machine Model HMS480 is 480mm which is suitable for machining nonmetal materials such as ABS shoe moulds and industrial models. 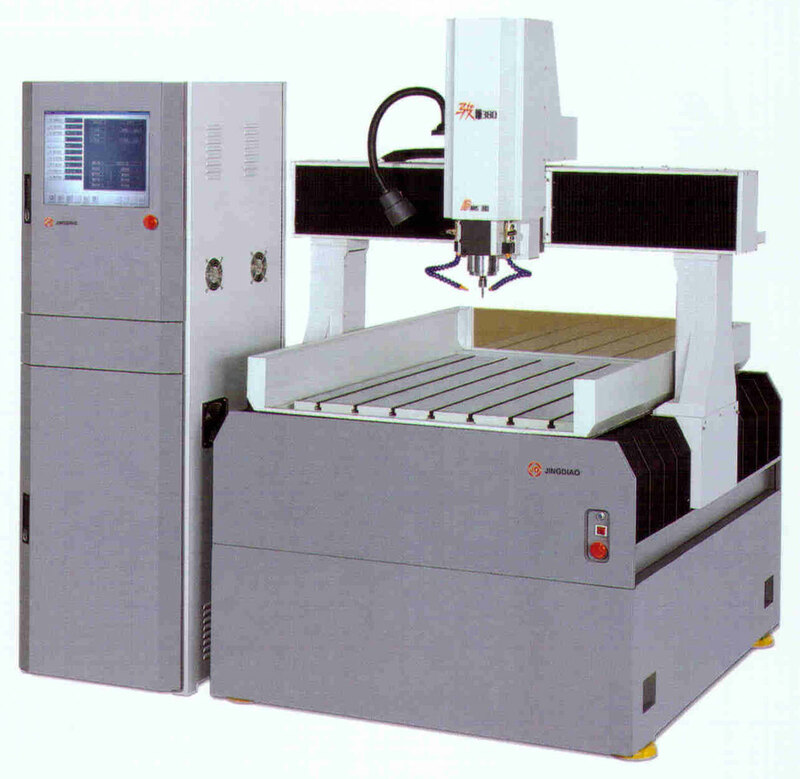 ◇ CNC Engraving Machine Model WMS has a movable horizontal transom and fixed worktable. 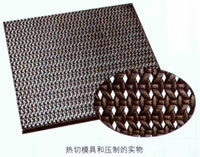 Such structure could bear a heavy burden and be suitable for large area and heavy products. ◇ Because the machining movement of CNC Engraving Machine Model WMS is multi axles superposing, the movement of axle Y has influence on axle X and axle Z. 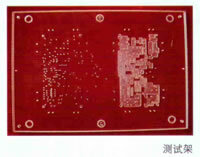 So CNC Engraving Machine Model WMS is difficult to manufacture high precision ±0.06mm prodcuts. ◇ CNC Engraving Machine Model WMS is more suitable for machining ply type moulds such as sole patterns' moulds and CNC Engraving Machine Model WMS could produce several sets of moulds at one time which could reduce moulds' cost much. ◇ CNC Engraving Machine Model WMS has 2 model, one is WMS200 and another is WMS380, the major difference is different feed heights. 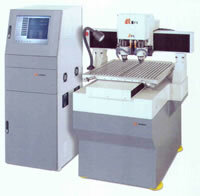 --The feed height of CNC Engraving Machine Model WMS200 is 200mm, it is a standard configure. 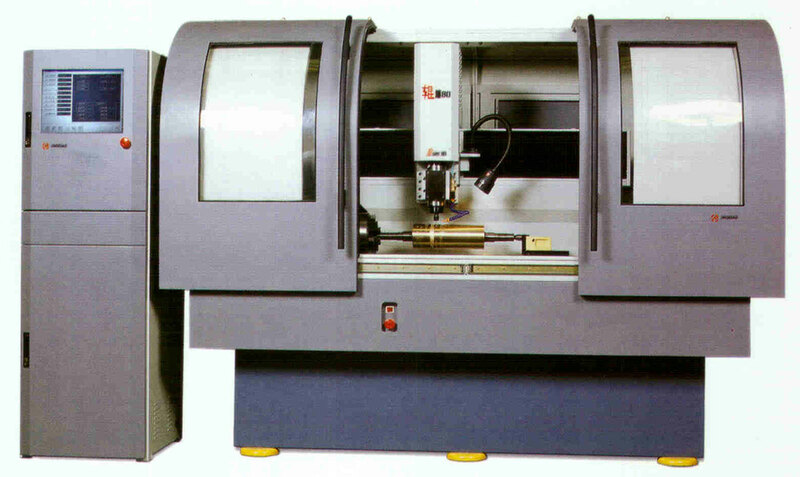 --The feed height of CNC Engraving Machine Model WMS380 is 380mm, which is suitable for machining thicker ply products. ◇ CNC Engraving Machine Model LMS is mainly used in machining nonmetal industrial materials. The structure characteristics is that its worktable, machine head and others moveable parts are made from cast aluminium which is light in weight and is suitable for high feed speed machining. The base of machine is cast iron parts which has stable structure and good shock asorption capacity. ◇ There are 3 models of CNC Engraving Machine Model LMS series which have different configures. --CNC Engraving Machine Model LMS200 is with 200mm feed height, it is a standard confirgure, it is adopted for industrial models' machining. --CNC Engraving Machine Model LMSXP is with 120mm feed height, there is a bottom notch with vacuum cupule, it is professionally used for machining organic thin boards such as windows of mobile telephone, panels of DVDs. --CNC Engraving Machine Model LMSDZ is with 200mm feed height, it is configured with dual machine heads, it is used for batch production. Its machining methods include single working procedure dual workpieces or single workpiece dual working procedures. Its axle Z could be solely controled and moving independently. ◇ CNC Engraving Machine Model FS is suitable for some production procedures of hair jewelleries such as drilling, lineation and edges cutting, it is batch production machine. 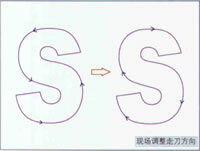 ◇ The 3 axles driving system of CNC Engraving Machine Model FS adopts AC servo system. 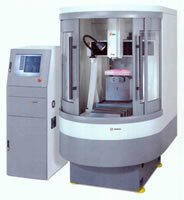 It has high average machining speed. Its single head's drilling speed could reach 8 holes per second. 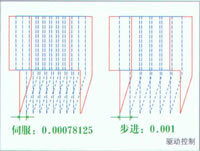 CNC Engraving Machine Model FS could drill according to scheduled depth, make lineation according to scheduled depth. The drilled holes have same roundness and depth. The edges of inlaid holes have no burrs and have good linearity. 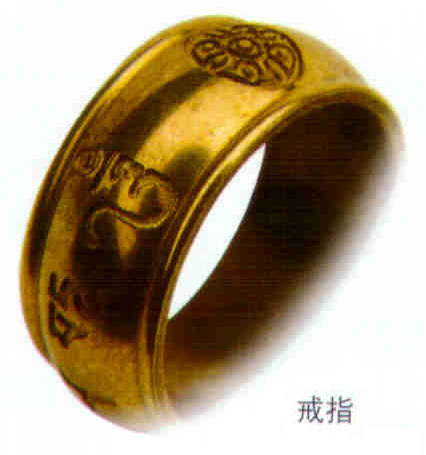 The inlaided jewelleries have good appearance. The edges of finished hair jewlleries have very smooth edges after cutting by professional cutting tools. Thus the last procedures require little processing and customers could reach high machining efficiency. ◇ CNC Engraving Machine Model GMS series are mainly used in machining bronzing rollers, empaistic rollers, knife mould rollers and column products. ◇ Because rollers usually require high precision, need long machining time and require high precision retentivity and stability, so CNC Engraving Machine Model GMS adopts Japan Nikken numerical control swivel table as rotation axis. 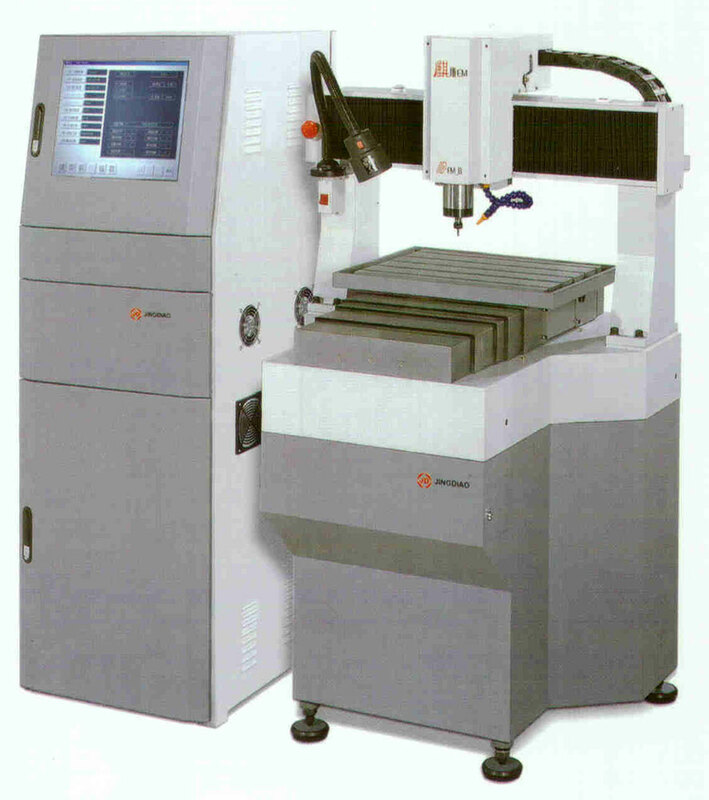 ◇ CNC Engraving Machine Model GMS series have 3 models, GMS60, GMS80, GMS120. 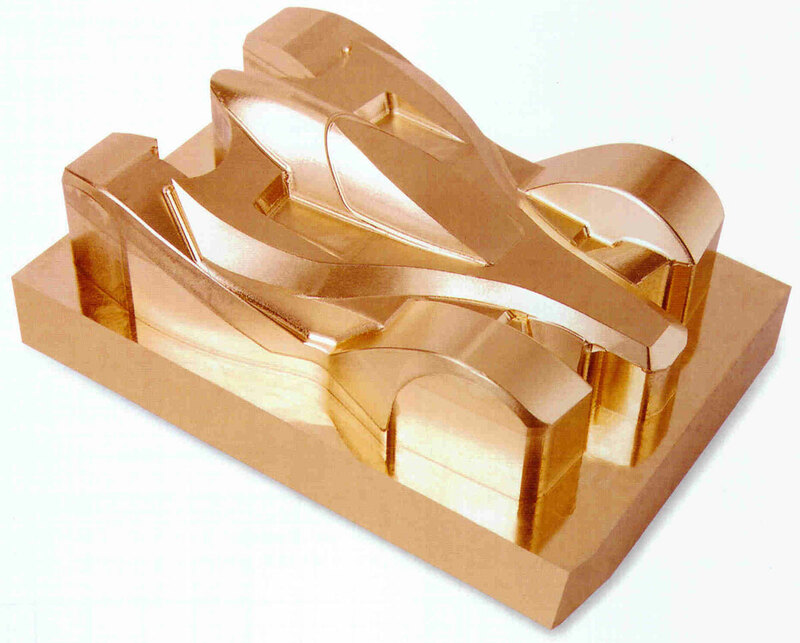 The major difference is that they could process different sizes of workpieces. ◇ High Speed Precision Main Axes Electrical Machinery is one of the major factors that guarantee engraving precision, high efficiency. ◇ High Speed Precision Main Axes Electrical Machinery is the power source of small cutting tools' machining. In order to insure small cutting tools could work under better status, High Speed Precision Main Axes Electrical Machinery should meet with these basis requirements as high rotary precision, quick rotary speed, low rotary vibratility, low rotary noise. for rough cutting on hard metal, such as Cr12. ◇ All the high speed precision main axes electrical machineries adopted in CNC Engraving Machines are specialize in small cutting tools' precision machining with "little feeding quick cutting" at high speed, high precision. 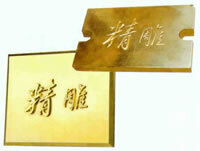 CNC Engraving Machines' Operators are prohibited to blindly setup "large feeding" rough cutting. 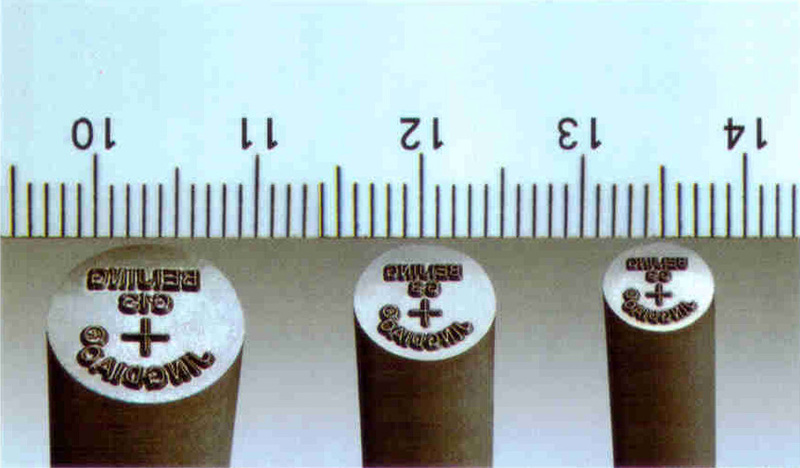 When cutting tools of diameter 4 or diameter 6 would be adopted for metal's some extent rough cutting, operators should strictly carry through manual's indicated procedures. ◇ During working, good cooling conditions should be guaranteed for main axes electrical machinery. 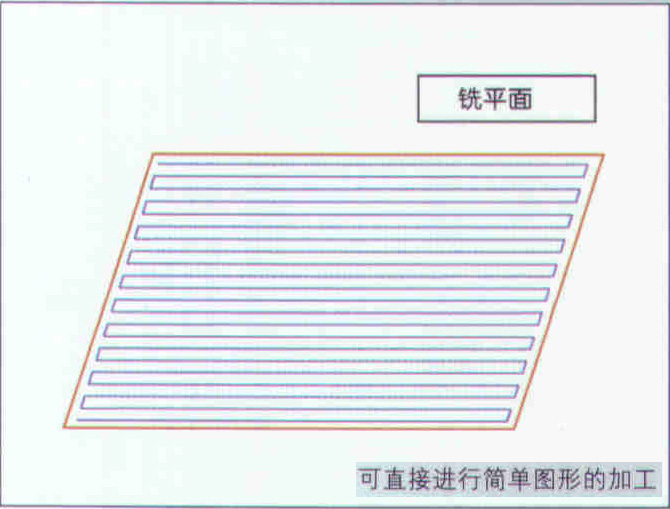 Bad cooling condition would accelerate abrasion of main axes electrical machinery's high speed bearing. 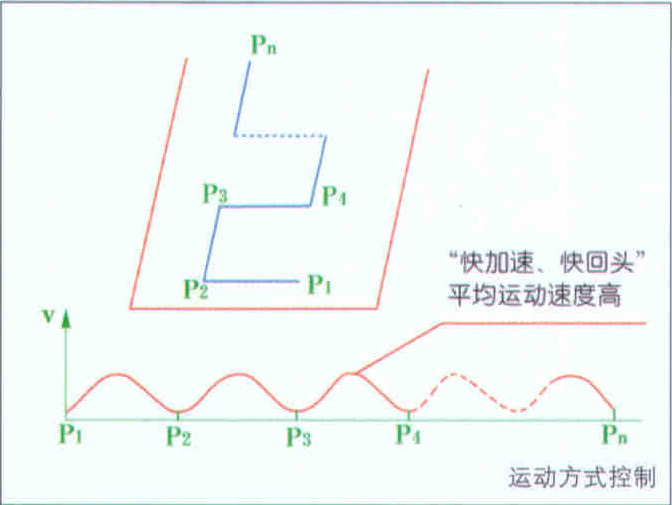 ◇ The structure of main axes electrical machinery is contraption, more carefulness should be paid at operations, especially the installation of cutting tools should be according to criterion. Hardily installing of cutting tools is strictly prohibitted. ◇ CNC Engraving Machines mainly adopt small cutting tools for machining. The intensity of cutting tools are rather week. Operators should absolutely install cutting tools and start cutting according to the process and methods in machines' manuals. Otherwise, cutting tools would be weared and teared faster which makes machining be obstructed and damages main axes electrical machinery. ◇ Due to high precision requirements on main axes electrical machinery and the high speed operation, the prices of the fittings of main axes electrical machinery are very expensive. These fittings include high speed bearings, cutting tools' clamps, lock nut, electrical machinery rotor, etc. ◇ The main axes electrical machinery is the most easily damageable fitting and it is the most expensive fitting among all CNC Engraving Machines' fittings. 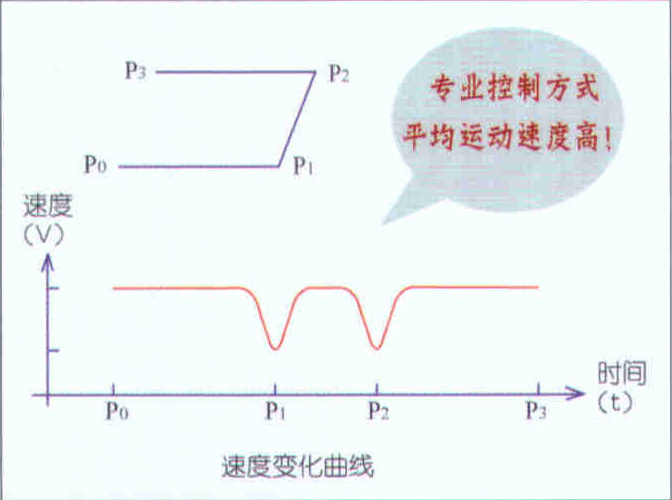 The life of main axes electrical machinery depends mainly on operator's usage. It is only following the operation methods presented by machines' manuals that minimum 3000 hours life time of high speed electrical machinery could be guaranteed. The life time of precision high speed electrical machinery means the time that such precision could be maintained. 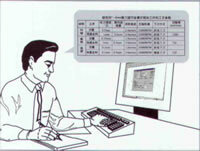 Longer life time is available if operations are run according to machines' manuals. Otherwise, the life time of such main axes electrical machinery would be very short! Whether CNC Engraving Machines could work well depends on the practicability of the machining procedures made by programming software! By reducing cutting tools' abrasion, JDPaint software could design reasonable processes to improve machining efficiency and insure precision and qualified rate of finished products. --Having "Equal Sections Cutting" as technical core, the CNC engraving process could avoid asymmetrically machining's cutting problem to guarantee precision guide line of finished products and reduce cutting tools' broken probability & improve machining efficiency. --All the "clear machining target, professional process, profuse machining methods, convenient process combination" brings up CNC Engraving Machines' characteristics of "Precision Works & High Efficiency". ◇ Main axes electrical machinery with high precision and high rotary speed. The basic principle of CNC engraving is small cutting tools' milling and cutting with little diameter cutting tools. So there are higher requirements on main axes electrical machinery's precision and rotary speed. --High rotary speed, which could supply higher cutting speed for small cutting tools and insure small cutting tools to gain better cutting capacity. --High manufacturing precision, low rotary noise, little jumpiness of tools' clamps to provide small cutting tools good working circumstance for milling and cutting. ◇ A control system with stable movement, vivid characteristics. The characteristics of CNC engraving are small and many machining areas, long accumulative total length, frequent start and stop, special disposal for movement's control. --Control method with "quick acceleration, quick turn back" could efficiently improve average speed of machining movement and insure machining efficiency. --High control precision of driving electric machinery, high movement resolving power could insure movement units work at high speed and reposefully. 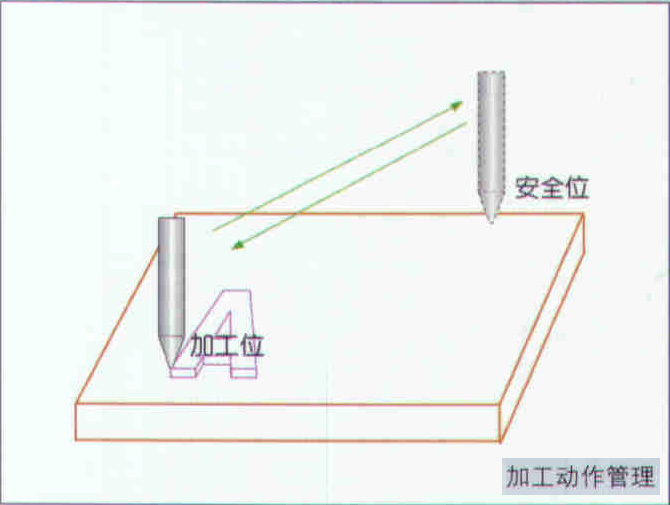 --In 2003, China engineers present Little Sections Ray Aligning Technology which could enhance servo driven CNE Engraving Machines much on surface machining, curve machining. 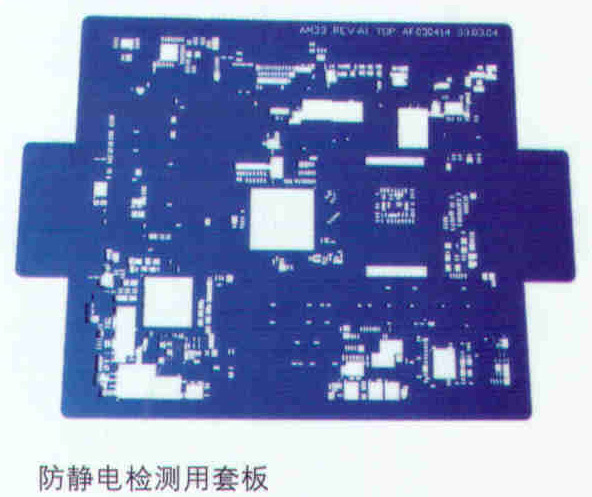 ◇ A machine body with good structure rigidity, high dynamic precision. Stable and high speed engraving machining movement is related with control system and more depends on the mechanical rigidity of machine body. --Integrated casting structure provide a stable worktable for movement units (guide rail and thread pole) and insure CNC Engraving Machines' stable movement and low noise. Thus finished products from CNC Engraving Machines could get good smoothness. 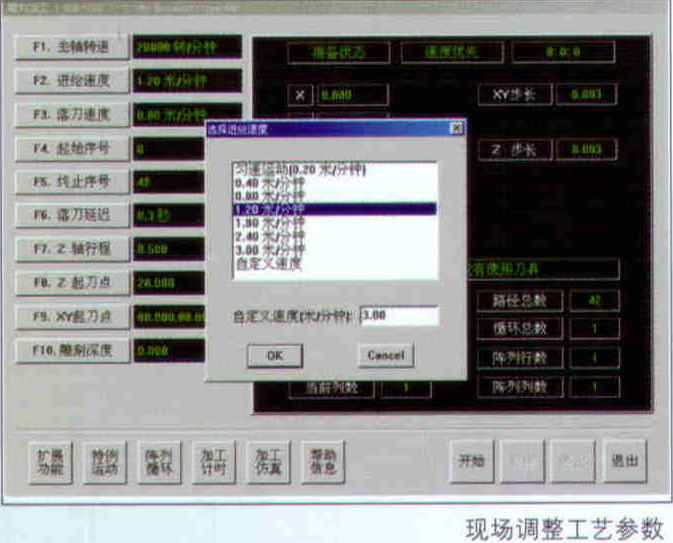 --Strict production management system could guarantee CNC Engraving Machines' movement characteristics index of positioning accuracy, repeatability positioning accuracy, movement sensitivity, etc. Thus CNC Engraving Machines could leave factory at high standard and guarantee machining's movement speciality in good status, finished products with smooth edges and figures with high definition. ◇ Cutting tools is the most important key factor that guarantees the precision of products made from CNC engraving machines and high efficiency of CNC engraving production. 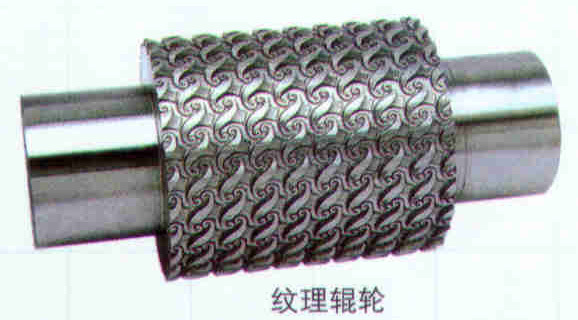 Besides adopting high speed main axle electric machinery and CAM (Computer Aided Manufacturing) technology, The canonical usage of cutting tools is an important guarantee to realize products' machining precision and efficiency. --The sizes precision of cutting tools should be high standard. A little size difference would bring large error and the machining procedure and result would be rather painful! --The raw materials of cutting tools should have good wearable performance which could insure a qualified cutting tools for CNE engraving machine's high speed main axle. 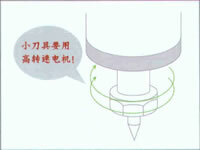 --Different process should adopt different cutting tool. One kind of cutting tool could not solve all kinds of problem. A professional cutting tool should be adopted to machining corresponding products and materials. ◇ Locale repairing capacity with convenience and practicality. CNC Engraving Machines mainly adopt small cutting tools for machining. Cutting tools' broken problem could hardly be solved. And due to influences from materials, process, cutting tools, workpiece clamping status, it is difficult to absolutely avoid contingency happening. It is informidable to meet trouble but how could we execute efficient trouble shooting. If our remedial methods are not correct, our machining efficiency would be badly influenced. --The selective machining functions of CNC Engraving Machines' operation platform could select machining areas according to areas, cutting tools, pathes, etc. The operators could conveniently repair machining misplays. 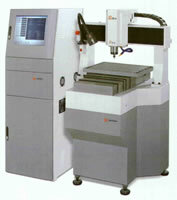 --The path editting function of CNC Engraving Machines' operation platform could edit current machining path' process. Thus the operators could conveniently edit and execute CNC Engraving Machines' process. ◇ It is a brainwork to define reasonable process parameters in the CAM software of CNC Engraving Machines after the operators' correctly understanding software's functions. A precision finished product could only come out from correctly making use of software according to canonical process. 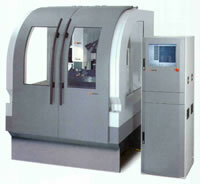 --To define process parameters only according to CNC Engraving Machines' process criterions. Don't start machining according to his envision before his correctly understanding machining's principles. --The sizes of cutting tools should be exact. A working style of measuring cutting tools' sizes should be hold. To correctly using cutting tools is a basic qualification to guarantee high qualified output of finished products. --To maintainance CNC Engraving Machines heart and soul. 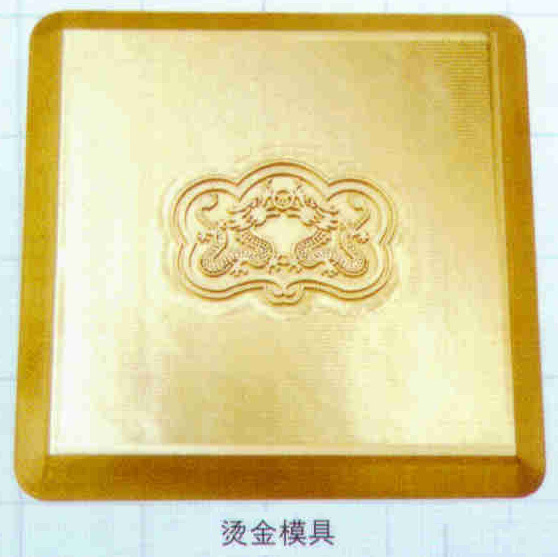 ◇ The usage of CNC Engraving Machines is basing on accurate description of sizes, accurate theoretically calculation and mature process method. However, most of customers of CNC Engraving Machines don't have above mentioned conditions, so please keep in close touch with our engineers when you meet any technical trouble. --Junior, secondary, senior technical training for operators. --Trouble shooting by phone, visiting. --Professional support on special process requirements. --Improving functions of software constantly to enhance the machining capacity of CNC Engraving Machines and expand the developping fields of customers' applications. 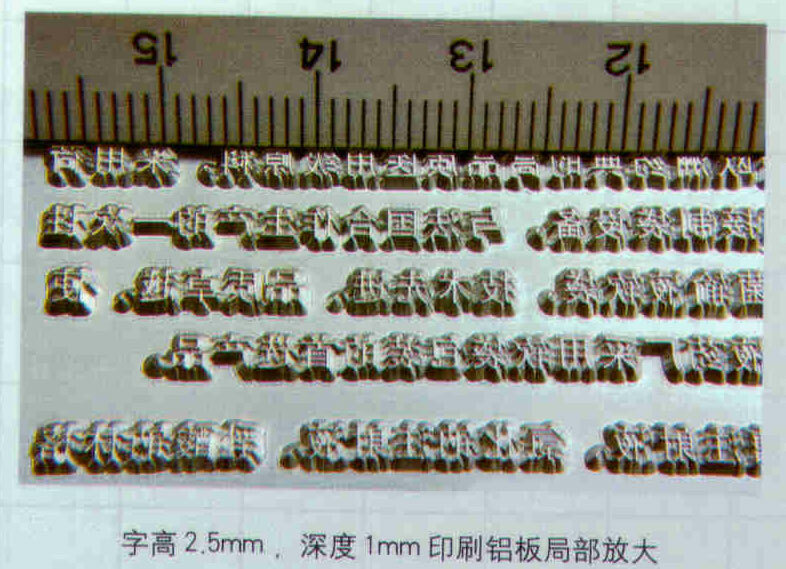 ◇ The products now could be made from CNC Engraving Machines include letters, designs through batch production and industrial products. In order to acclimatize itself to different machining process, CNC Engraving Machines should have local management functions for machining process which have been integrated into En3d control program software of CNC Engraving Machines. ◇ Unique selective machining function. We only choose accidentally damaged area for remachining, reengraving. Thus we could avoid invalid, repetitious repairing work and realize high efficient work. ◇ The functions and characteristics of CNC Engraving Machines' selective machining. --Unique capacity of choosing machining area according to figures, sequence numbers, cutting tools, surfaces for efficiently implementing continous machining upon unconventionality circumstances of partial finishing machining. --Large machining area pathes could be separated into small areas for repairing. Thus cutting tools would not re-cut on those areas which have been machininged. That is, "Empty Cutting" phenomenon could be avoided and higher machining efficiency could be gained. --Graphical interfaces for easy operation and convenient usage. 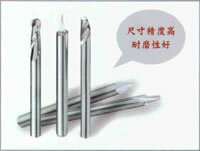 Practical cutting tools' pathes editting and repairing functions. ◇ During industrial machining production, due to influence of abrasion of cutting tools, rigidity aberrancy of longish cutting tools, distortion of materials, improper clamping and unreasonable process, etc., some machining errors might be arised. In order to improve machining efficiency, such CNC Engraving machines should/could allow locale operators to repair and refine edges pathes immediately. 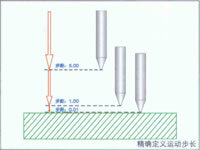 ◇ The characteristics of En3d cutting tootls' pathes editting and repairing. --For appointed area's edge pathes, En3d software could apply directly cutting tool's compensation and create new repair and refine machining pathes. --For appointed cutting tool's pathes, En3d software could copy and move these pathes and create conveniently such cutting and repairing pathes for adequately utilize raw materials. ◇ It is necessary of trial cutting in the machining of industrial products. 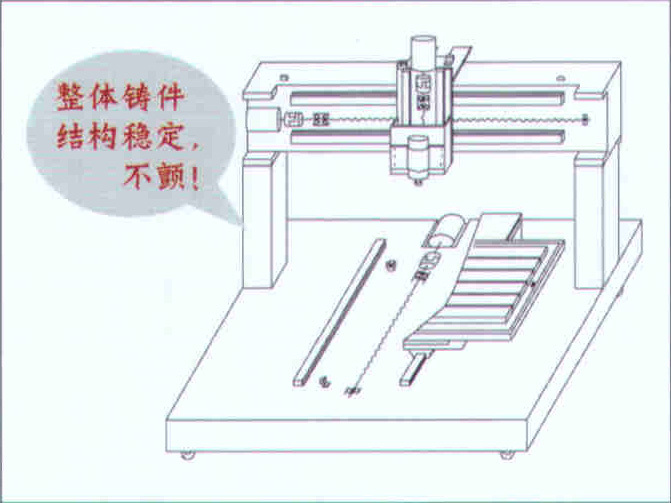 During such trial cutting course, CNC engraving machines should be able to adjust parameters such as feeding speed, principal axis circumvolving speed and machining depth, etc. 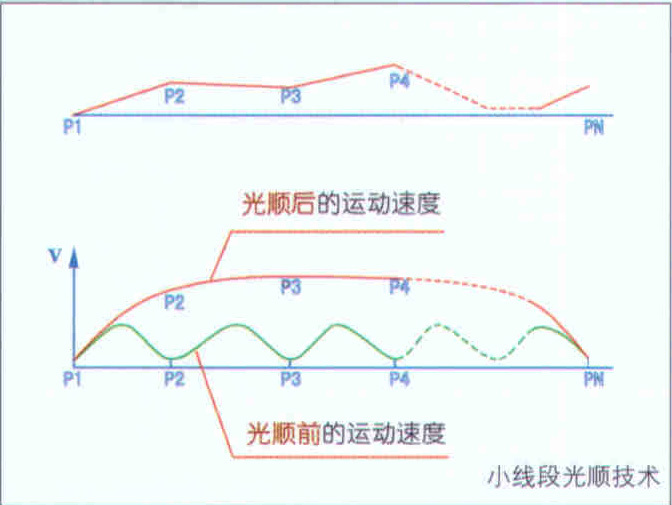 ◇ The operation management function of En3d software. 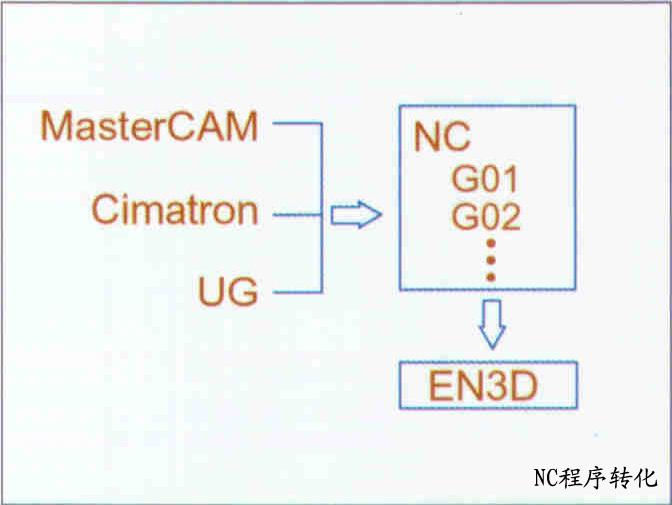 --En3d software could adjust parameters in time on control interface, such as feeding speed, principal axis circumvolving speed and machining depth, etc. Thus En3d could realize optimization of process parameters. --En3d software could conveniently define operation paramters of feeding speed, principal axis circumvolving speed of machining's program sections to realize process's standardization. For batch production, the machining method has obvious influence on machining efficiency. ◇ En3d software's characteristics of batch products' machining methods. --Circularly carving method is suitable for one type of products, single station batch machining by uniform definition operation actions to reduce operation steps and realize flow type production. 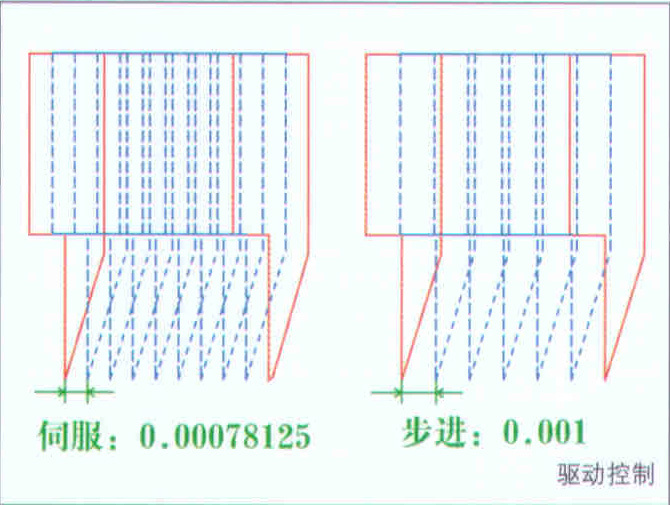 --Array carving method is suitable for one batch products, or whole partial areas of batch products to reduce workload of machining programme and improve efficiency by reducing communication data bytes. ◇ CNC Engraving Machines are some professional small cutting tools machining device, its small cutting refining machining process is rather characteristic, when operators adopt other softwares to design products, they should use JDPaint software to create machining process, if the machining process flowcharts only provide NC program, operators could transform NC programs in En3D software. 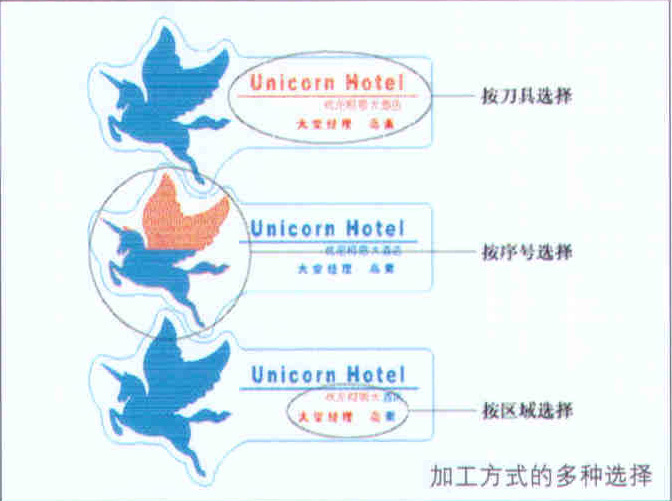 ◇ The characteristics of NC program transforming in En3d software. --Transform NC program's G code format into movement instruction that could be accepted by CNC engraving machines. --Redefine operation protection process when start to cut. CNC Engraving Machines: Convenient Locale Adjusting Path Directions ing machining should be adjusted correspondingly to insure better machining results. 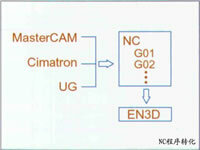 ◇ The characteristics of En3d software's moving direction adjustment function. --Adjust machining directions of whole section's machining program and make same program adapt to different machininged materials. --Adjust current machining directions to realize partial accurately repairing. 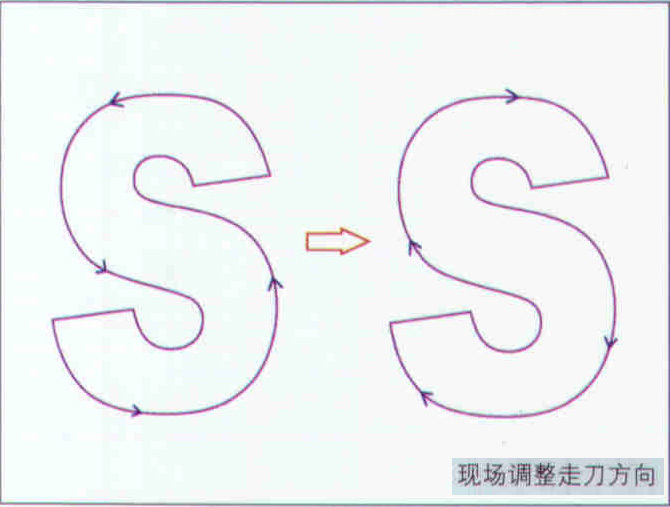 ◇ Succinct movement management of batch machining. ◇ It is said that the production of batch products should not lost even a second. 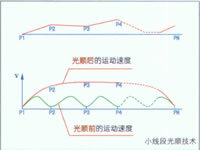 The less movement of feeding and discharging materials, the more machining efficiency could be improved. 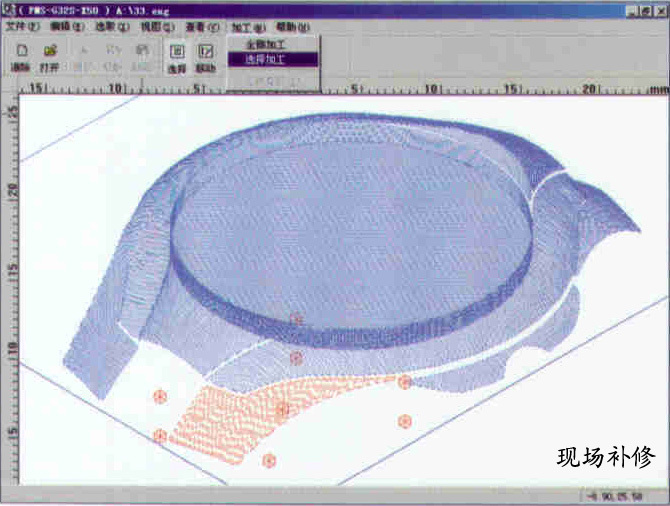 ◇ The characteristics of En3d software's movement management of batch machining. 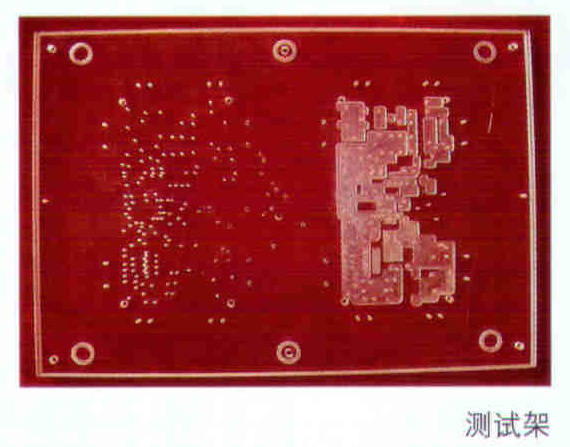 --The working tableboard could be moved to fixed position for discharging after former product's finished. --Integrally save latest machining operation information, operators could start new products machining according to latest machining parameters by pressing a button on keyboard only. 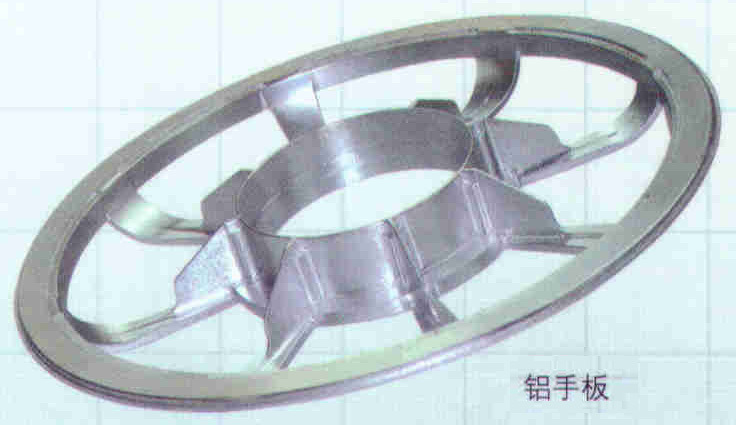 --The principal axis could keep circumvolving when feeding or discharging materials. 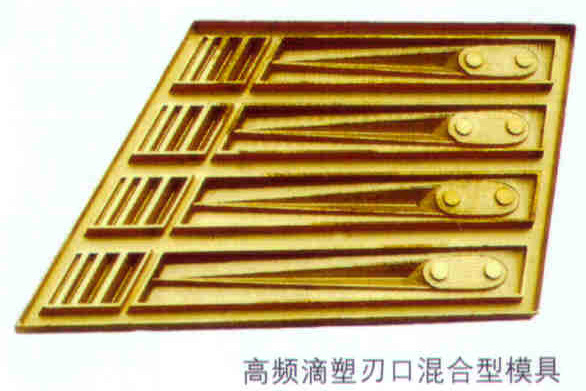 The machine head could be automatically moved to right crossbeam. Thus operators not only reduce waiting time at start machine but also avoid machining damages obviously. ◇ Applied and simple geometry figure machining. 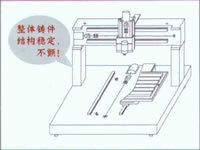 ◇ CNC engraving machine should have machining program otherwise it would not work. 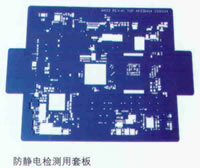 However, there are some simple machining work such as milling rectangle area or round area. If we discharge rectangle materials or round materials and then start programming, it certainly will influence machining efficiency. --Milling rectangle area and round area, figures could be defined according to sizes. Thus accurately milling machining on materials' surfaces could be conveniently carried through. --Cutting rectangle area and round area, figures oculd be defined according to sizes, Thus discharging materials could be carried through conveniently. 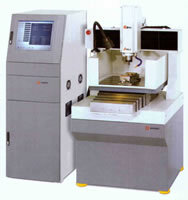 ◇ CNC engraving system adopts PCBase framework with independent PC computer as control platform. 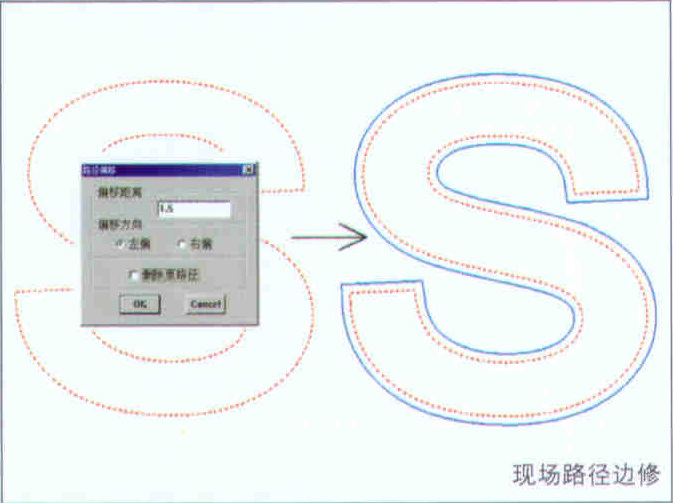 In June, 2002, our CNC engraving system is updated to Windows version. Thus CNC engraving machines could provide more convenient operation graphical interfaces and applied technics management function. 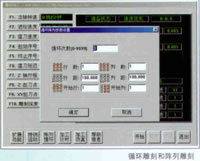 And at the same time, it gives more spaces for CNC engraving machines' application fields. ◇ The control system and management function of CNC engraving system is realized by En3d software. ◇ Refined drive technology. The electric machinery drive technology is the basis of CNC engraving machines' movement. 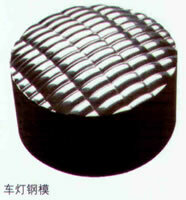 Refined drive technology provides basic guarantee for accurately carving. 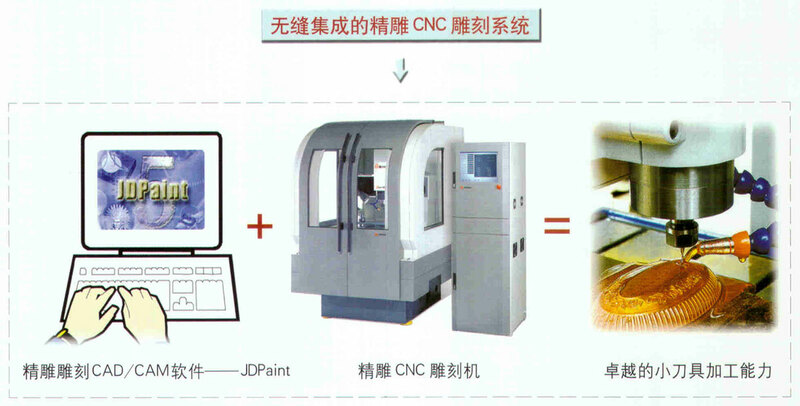 ◇ The performance of accurately drive technology of CNC engraving machines' numerical control system. --The AC servo drive system of CNC engraving machine makes machine body moving reposefully at high control precision 0.00078125mm/pulse. 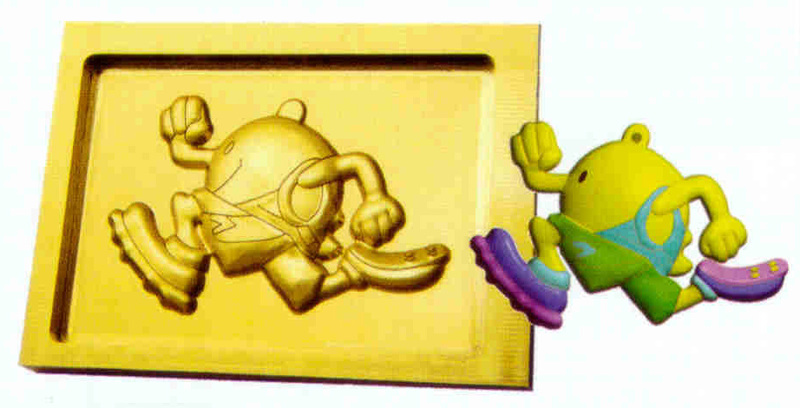 The movement speed and acceleration could reach higher level. Thus movement average speed could be improved greatly. --The step drive system of CNC engraving machine adopts advanced microstep fractionize technology. So machine works reposefully at high control precision 0.001mm/step. 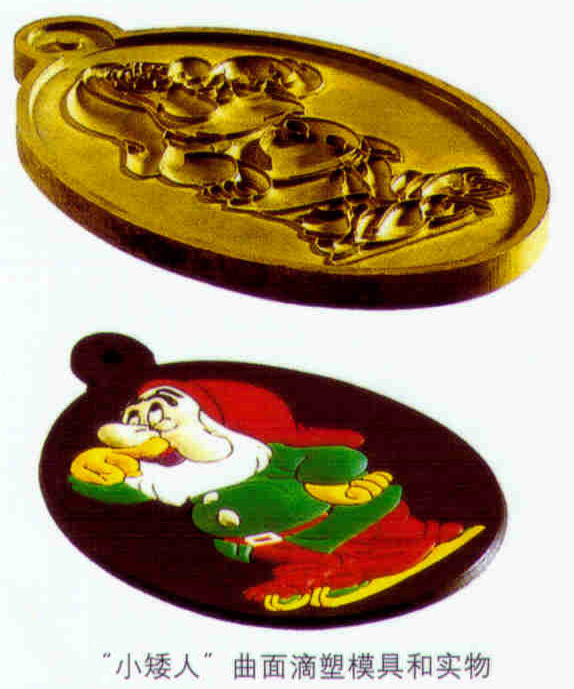 ◇ CNC Engraving is a small cutting tools, small area carving. The machining efficiency is mainly dependent on cutting tools' average movement speed during machining movement. 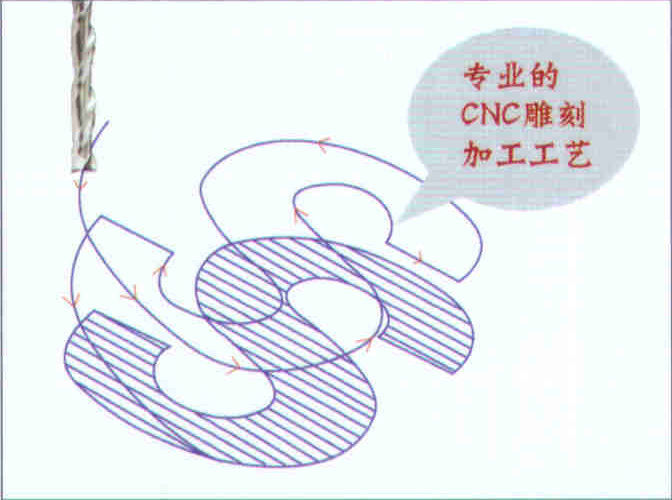 ◇ The characteristics of CNC engraving numerical control system's quick accelerating quick turn back movement method. --Large accelerating at start, high average speed of machining movement to guarantee CNC engraving machines have higher machining efficiency in small areas' machining movement. --Stable turn back movement to guarantee little dithering of CNC engraving machines and insure good smoothness and brightness of finished products. ◇ High efficiency little sections light arranging technology. ◇ Relievo surface has complicated shapes, there are mainly little broken lines after creating machining pathes. 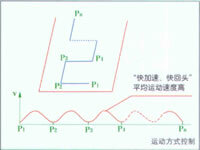 Thus it will influence machining efficiency and increase dithering of machine body's movement. In order to improve surface's machining efficiency, our engineers have integrated little sections light arranging technology into CNC engraving machines which are equiped with servo system. 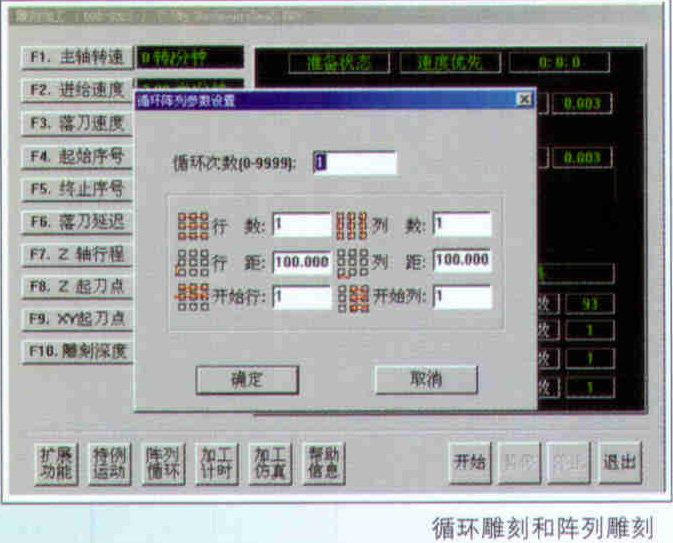 ◇ The applied effect of CNC engraving numerical control system with little sections light arranging technology. --Greatly improve surface machining speed. By running CNC engraving machines with AC servo drive system, the machining time on standard surface is not more 20% longer than the machining time on same sizes of plate surface. --Improve stability of machine body's movement, reduce dithering of machine body on machining surface and greatly improve surface smoothness of finished products. ◇ Unique pace-fixing movement. Many operations of CNC engraving machines need very accurate fixed pace movement, especially on matching cutting tools and finding anchor point of products. ◇ The applied characteristics of CNC engraving numerical control system's pace-fixing movement. 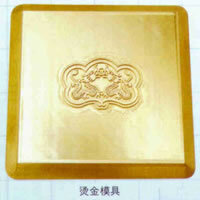 --It is a very precision work for cutting tools of CNC engraving machine. Moreover it is a interacting operation, incorrect matching of cutting tools would not only reduce machining precision but also damage cutting tools and make machining progress a "painful" experience. 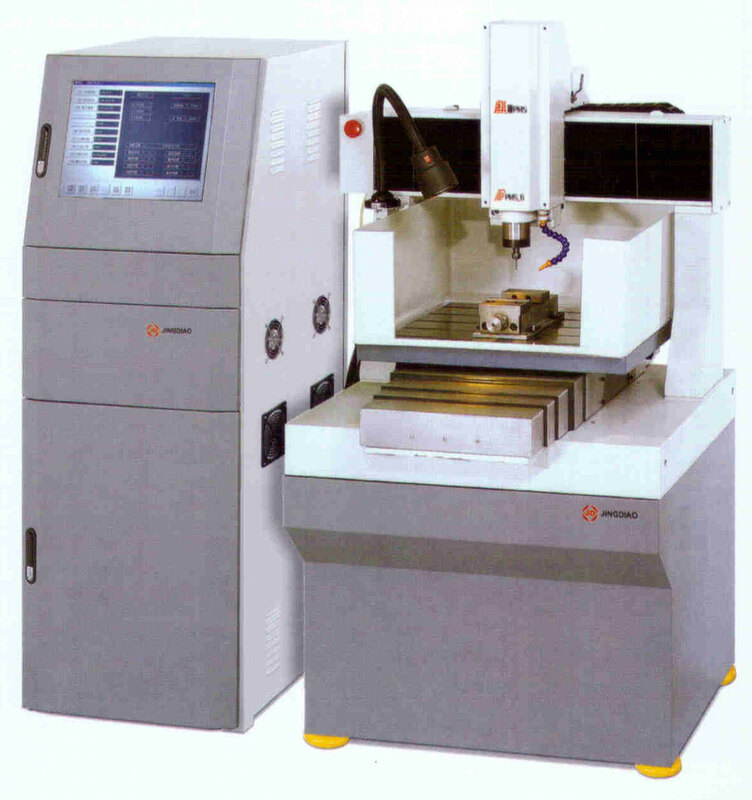 CNC engraving control system could quickly define movement pace with minimum 0.005mm/pace. Thus we could conveniently and accurately match cutting tools. 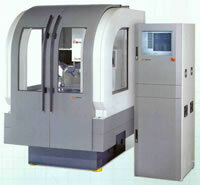 --In order to improve machining efficiency, CNC engraving machines are often formed a complete set with other equipments. 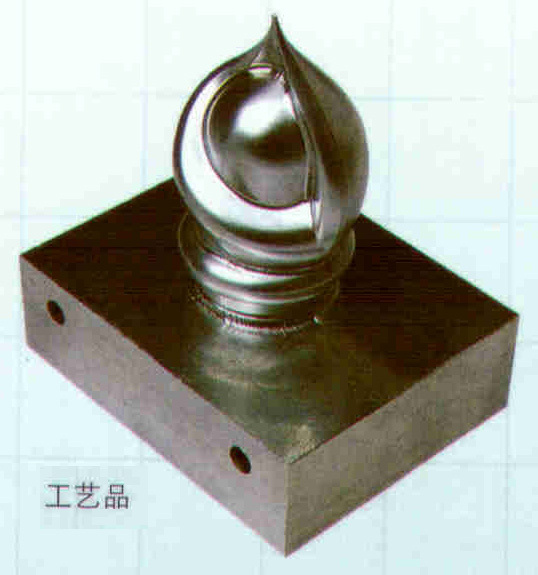 It is important to find correctly product's anchor point for such complete set. The pace-fixing movement of CNC engraving control system provide powerful support for accurately finding such anchor point. ◇ Machining requirements: The surface of electrode should be holistic smooth. The joining positions should be refined to remove burrs. ◇ Machining difficulties: To meet with requirements first, operators should match reasonable machining parameters of rough machining, semi-precision machining, precision machining, burrs refining. 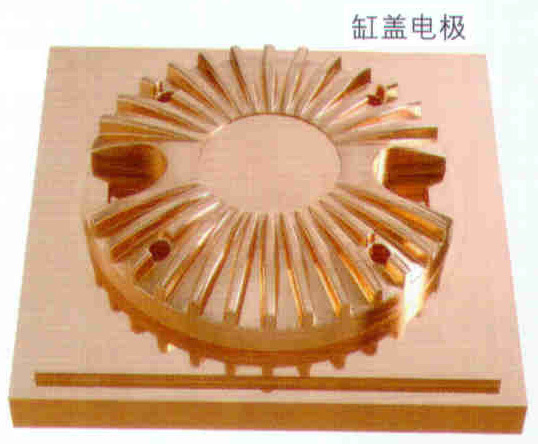 --For layered areas' rough machining, D6 flat-bottomed cutting tool, machining time 2 hours 10 minutes. --For figure's contour lines semi-precision machining, D4 ballhead cutting tool, machining time 1 hour 5 minutes. --For parallel serifs precision machining, D4 ballhead cutting tool, machining time 2 hours 25 minutes. --For first burrs refining, D2 ballhead cutting tool, machining time 30 minutes. --For second burrs refining, D1 ballhead cutting tool, machining time 35 minutes. So total machining time needed is 6 hours 45 minutes. 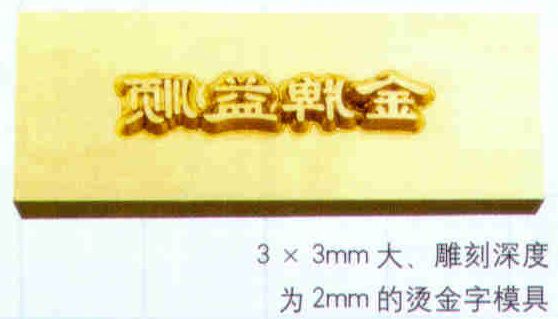 ◇ Machining requirements: Minimum 0.5mm letter should be legible under 100 magnifier, no burrs on edges. 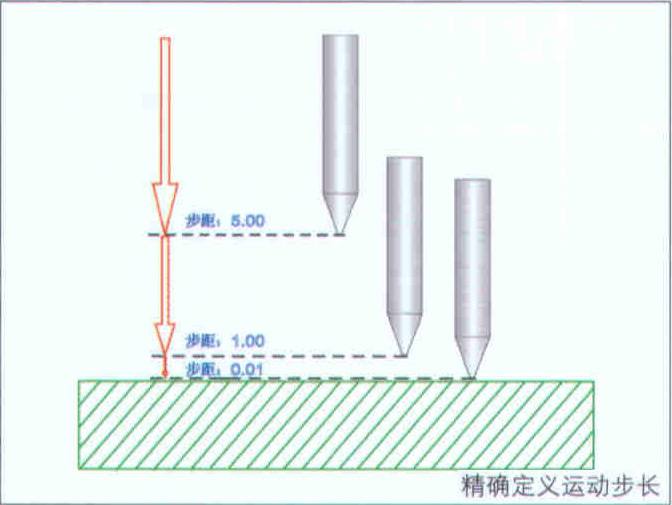 ◇ Machining difficulties: Long time corner-cleaning machining on Cr12 materials with 82°-0.05 small cutting tool. ◇ Machining cutting tools: Prick cutting tool 82°-0.2, 82°-0.05. ◇ Machining time: Large punch 1 hour, middle-size punch 1 hour 10 minutes, small punch 1 hour 30 minutes, it takes prick cutting tool 82°-0.05 1 hour to machining small punch. --There should be depth gradual change of relievo shapes in 0.17mm carving depth, there should be not platforms and depth saltations in bottom. --The cutting veins of machining face should be even, non veins saltations are allowed. Thus to insure polish technics could reach mirror effect. ◇ Machining difficulties: to guarantee even relievo effect in 0.17mm carving depth. ◇ Machining time: 30 minutes for surface machining. ◇ Products' characteristics: Deep groove thin thickness, precision figures. --Same top width at groove area. Guaranteed in 0.2mm. --Highly polished surface reaches 0.8um, no need to polish again before usage. --The deepest depth could reach 3mm to guarantee full and stereo effects of pressed finished products. --Even layers intergradation, smooth pressed finished products. --To guarantee same top width, just adopt one cutting tool when machining. --To guarantee same depth, just adopt less 20°cutting tool when machining. ◇ Keypoint of technics: Three-dimensional corner cleaning. ◇ Cutting tools needed: D3 screw thread cutting tool, 20°-0.4 wimble cutting tool, 20°-0.2 wimble cutting tool. ◇ Machining time: Total 10 hours, thereinto more than 4 hours for three-dimensional corner cleaning with 20°-0.2 wimble cutting tool. 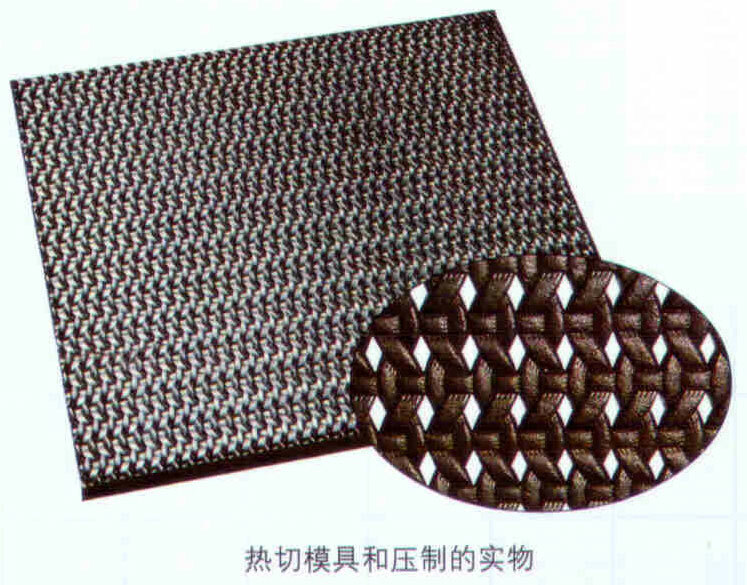 ◇ Products' characteristics: Relievo surface, letters and standard surface are tied in. 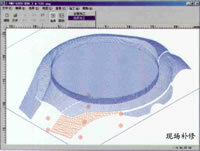 --The roughness of electrode surface should reach 0.8um, cutting veins are even under 40 magnifier without saltation. --Biggish carving machining curvature, complicated shapes copper electrode should be reach milling and cutting effects. --Biggish materials cut off works, long machining time. --The abrasion of cutting tool should be slown down, otherwise machining efficiency is very low. ◇ Keypoint of technics: Layered grooves, little feeding, quick cutting tool's moving. 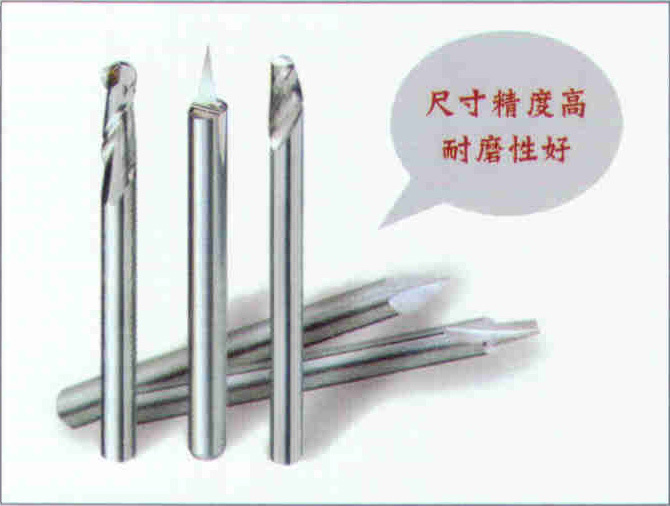 ◇ Cutting tools needed: D3 helix milling cutter, 30°-0.5 wimble cutting tool, 30°-0.2 wimble cutting tool. ◇ Machining time: Total 12 hours 4 minutes, thereinto 8 hours for 30°-0.2 wimble cutting tool's machining. ◇ Products' characteristics: Lifelike relievo design, colors insulated lines are same depth same width. 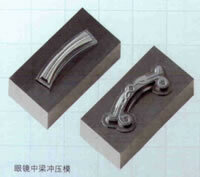 --The roughness of mould surface reaches 0.8um and need not be polished again. 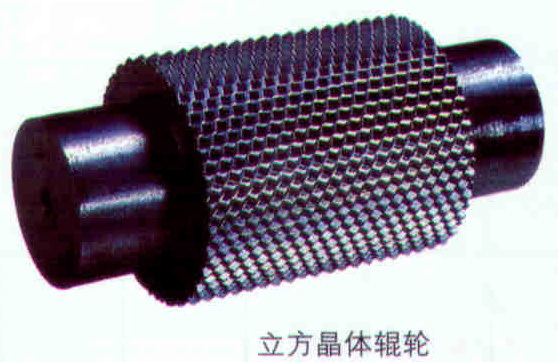 --Repetitious machining on same product to guarantee high machining efficiency. --Mould precision machining should at the same time guarantee the definition of relievo, surface roughness and machining efficiency. --The machining of colors insulated lines requires to adopt around 10°-0.2 wimble cutting tool. Otherwise the tip of poor intensity cutting tool is easily damaged. ◇ Keypoint of technics: Layered carving, little sections light arranging technology. ◇ Cutting tools needed: 20°-2.0 wimble cutting tool, D1.0 ball cutting tool, 10°-0.2 wimble cutting tool. ◇ Machining time: 2 hours 21 minutes 40 seconds. 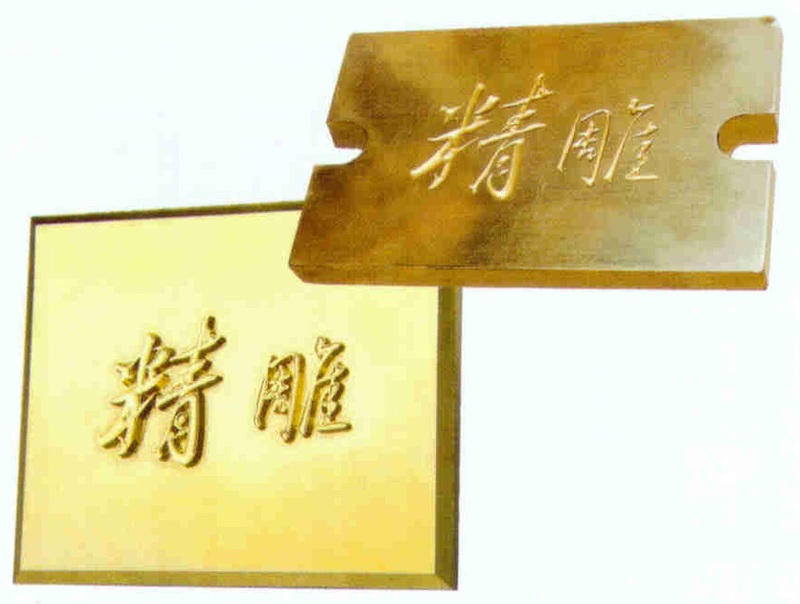 ◇ Products' characteristics: Sharp-edged cutting blade, legible veins. 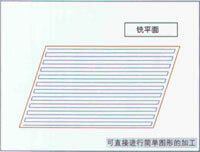 --Hot cutting blade should be sharp-edged, the thickness of blade is 0.1mm, the height of blade is 1mm. --Make out legible surface shapes for leather made up and pressed veins lines. 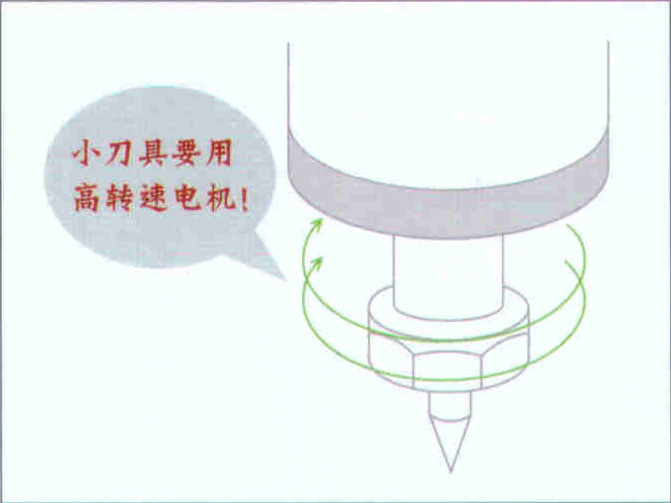 ◇ Machining difficulties: Cr12 materials are rather rigid, in order to guarantee better blade effect and veins effect, small cutting tool could not be weared and teared too fast, moreover during long term machining, operators should guarantee in technics that after cutting tool's abrasion there should be no further ruleless leftover arised, after cutting tool's replacing, there should be better machining effect and machining efficiency. ◇ Machine model: Carver 280. 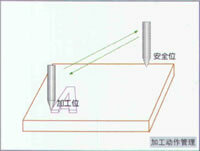 ◇ Keypoint of technics: Groove notching type equal cutting. ◇ Cutting tools needed: 60°-0.4 wimble cutting tool, D1 ballhead cutting tool. ◇ Machining time: 30 hours. Toy vehicle five sides electrode copper mould which is made from CNC engraving machines. Telephone electrode copper mould which is made from CNC engraving machines. 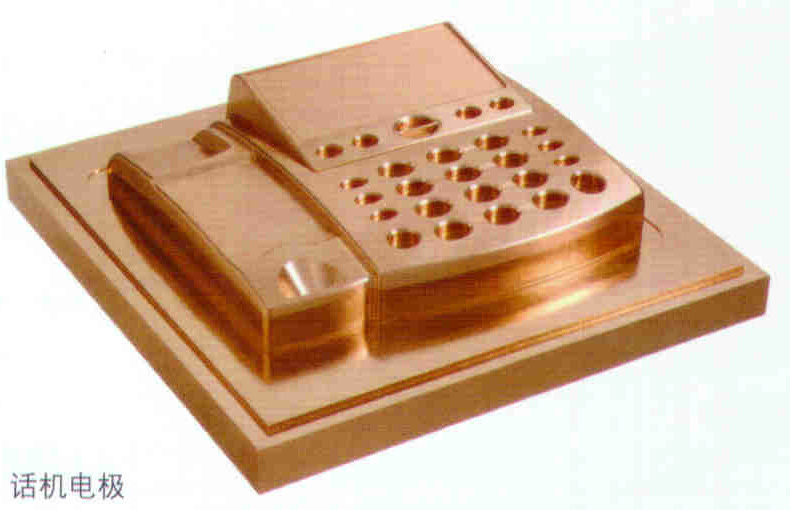 Handset keyboard multi poles electrode copper mould which is made from CNC engraving machines. 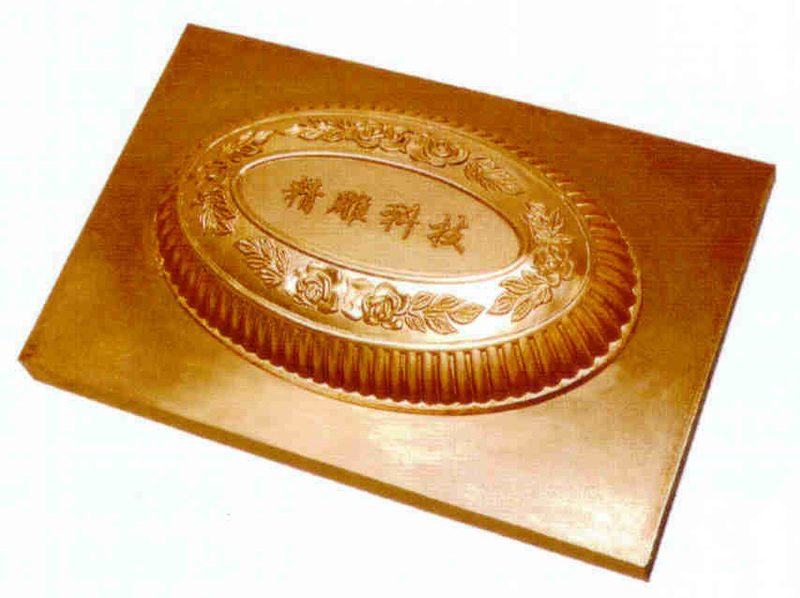 Crock cover electrode copper mould which is made from CNC engraving machines. 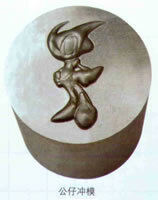 Cartoon die mould which is made from CNC engraving machines. 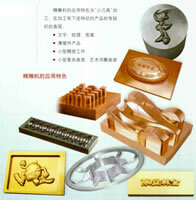 Precision die mould which is made from CNC engraving machines. Poker surface plasic dripping mould which is made from CNC engraving machines. 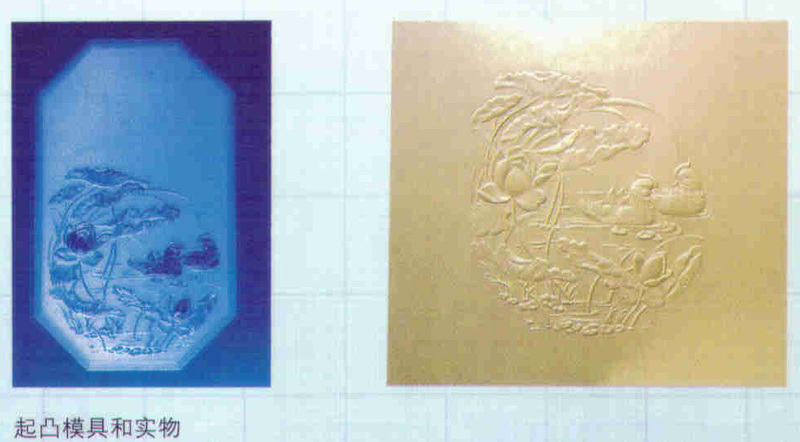 Pygmy surface plastic dripping mould which is made from CNC engraving machines. 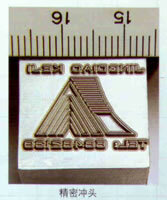 L3mm W3mm Depth2mm Bronzing letters which are made from CNC engraving machines. 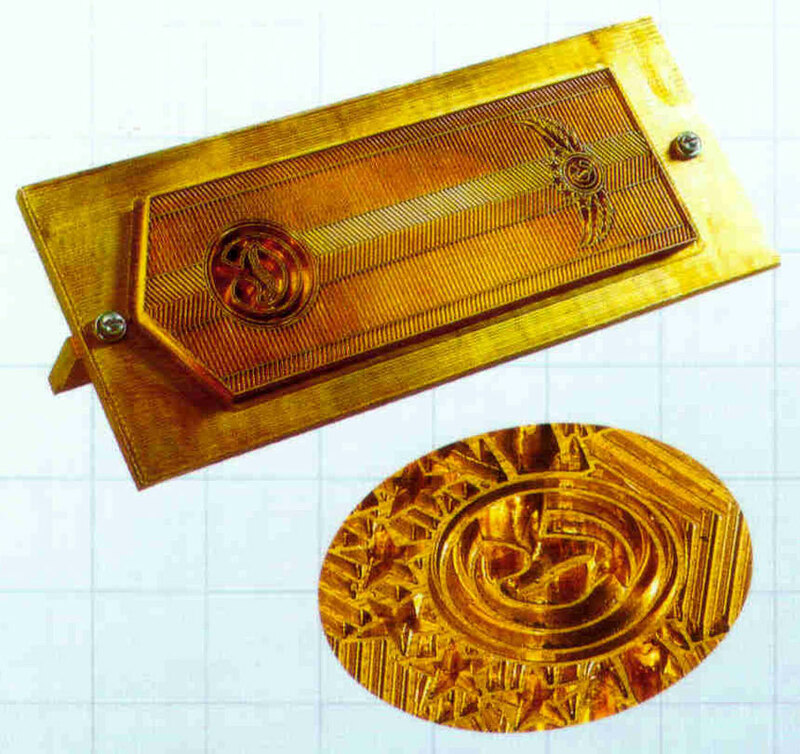 Dual dragons bronzing mould which is made from CNE engraving machines. Bronzing mould which is made from CNC engraving machines. 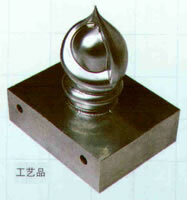 Protruding mould which is made from CNC engraving machines. 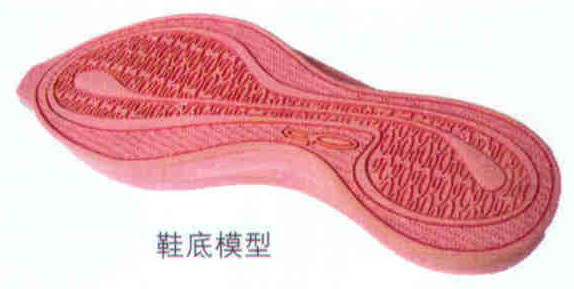 Shoe sole mould sample which is made from CNC engraving machines. Aluminium shoe sole mould sample which is made from CNC engraving machines. 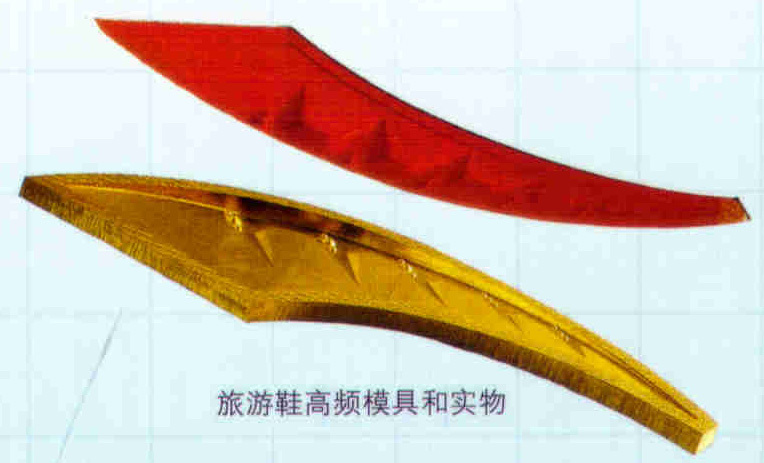 Shoe high frequency plastic dripping blade composite mould which is made from CNC engraving machines. Shoe hot cutting mould which is made from CNC engraving machines 01. Shoe hot cutting mould which is made from CNC engraving machines and its pressed sample. 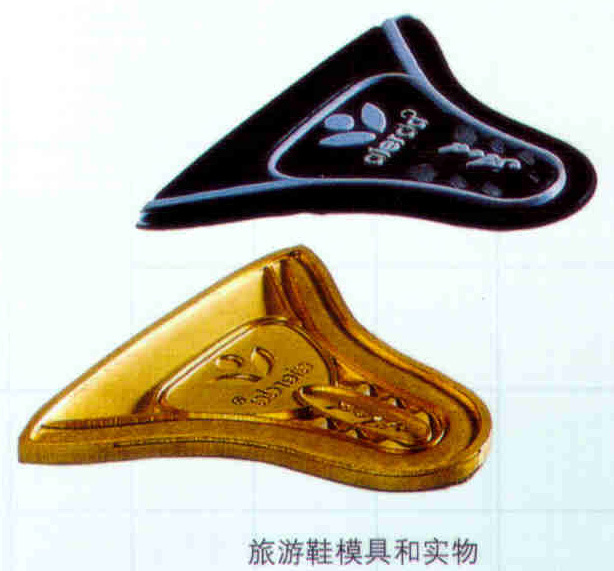 Trekking shoe mould which is made from CNC engraving machines and its sample. 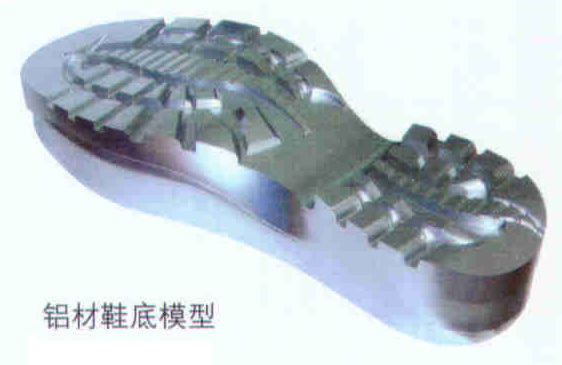 Trekking shoe high frequency mould which is made from CNC engraving machines and its sample. 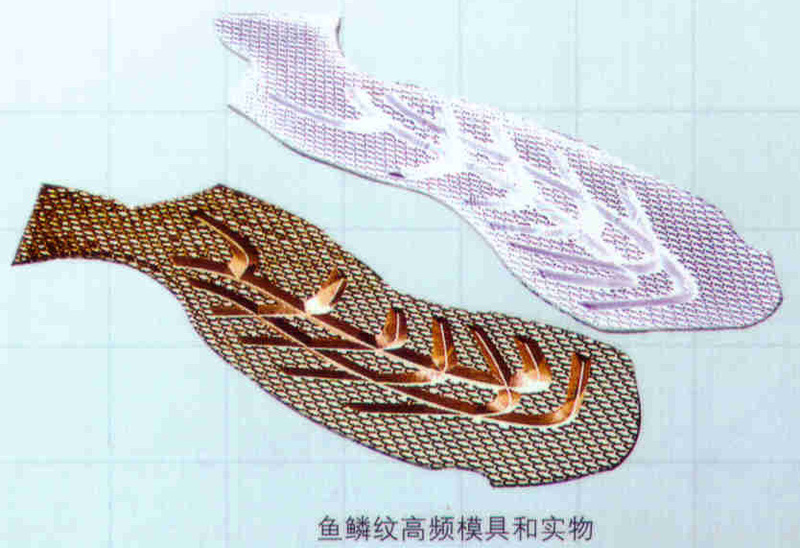 Fish scalelike shoe high frequency mould which is made from CNC engraving machines and its sample. Phone mike steel mould which is made from CNC engraving machines. 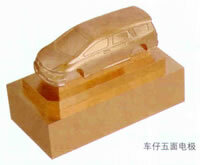 Vehicle lamp steel mould which is made from CNC engraving machines. Veins roller mould which is made from CNC engraving machines. 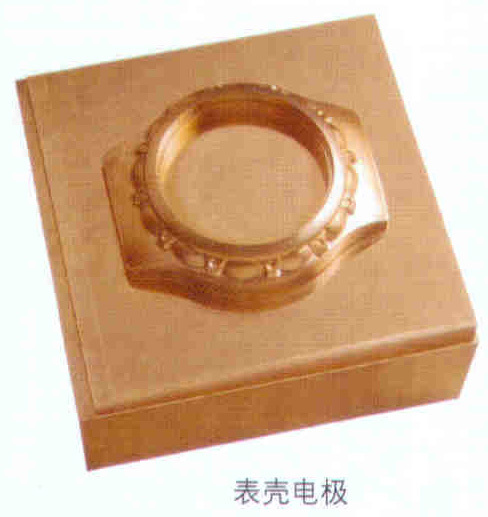 Cubic crystal roller mould which is made from CNC engraving machines. Bronzing roller mould which is made from CNC engraving machines. 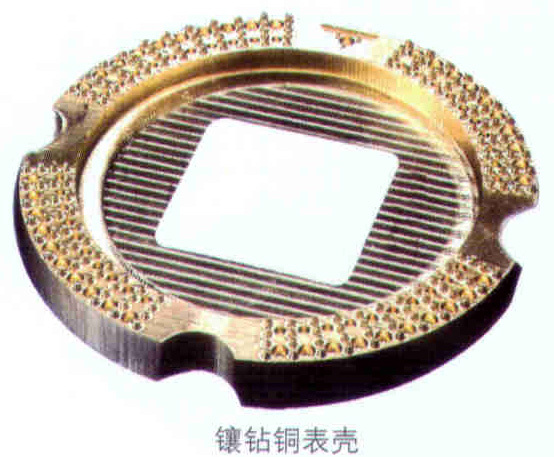 Watchcase electrode which is made from CNC engraving machines. Tessellate copper watchcase which is made from CNC engraving machines. Dial die which is made from CNC engraving machines and its sample. 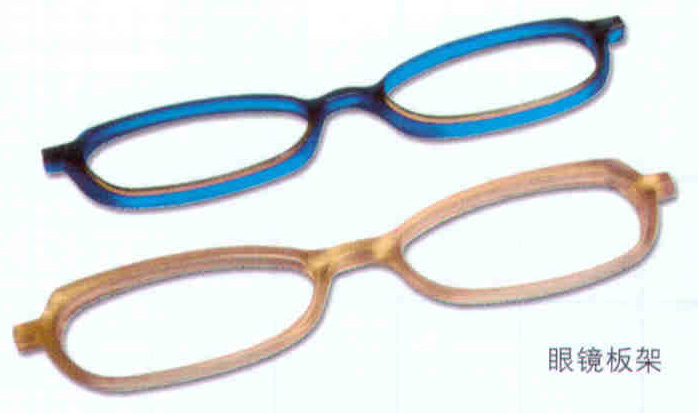 Glasses frame mould which is made from CNC engraving machines. 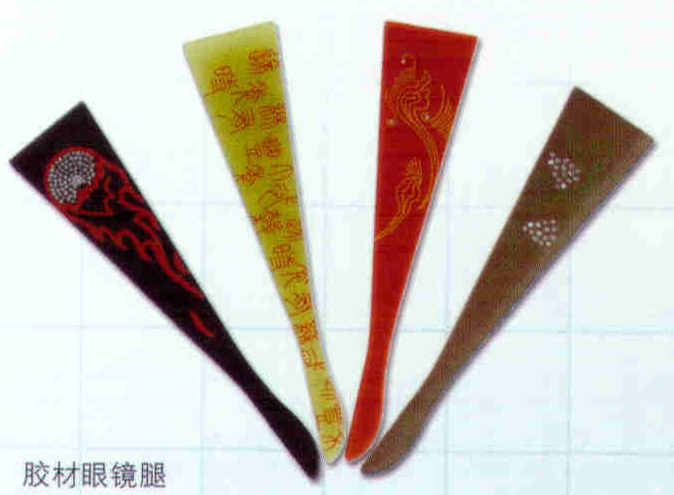 Glasses leg die mould which is made from CNC engraving machines. Glasses metal legs mould which is made from CNC engraving machines. 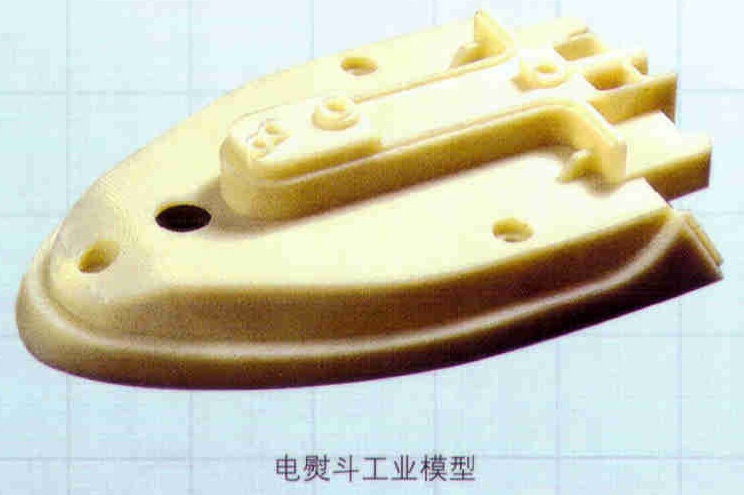 Plastic rubber glasses legs mould which is made from CNC engraving machines. Glasses middle girder die mould which is made from CNC engraving machines. 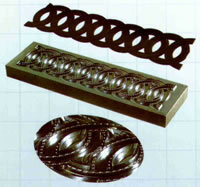 Industry prototypes smelt stannum utensil SMT mould which is made from CNC engraving machines. Industry prototypes testing frame mould which is made from CNC engraving machines. Industry prototypes organic materials pannel which is made from CNC engraving machines. Industry prototypes anti static inspect sheath mould which is made from CNC engraving machines. 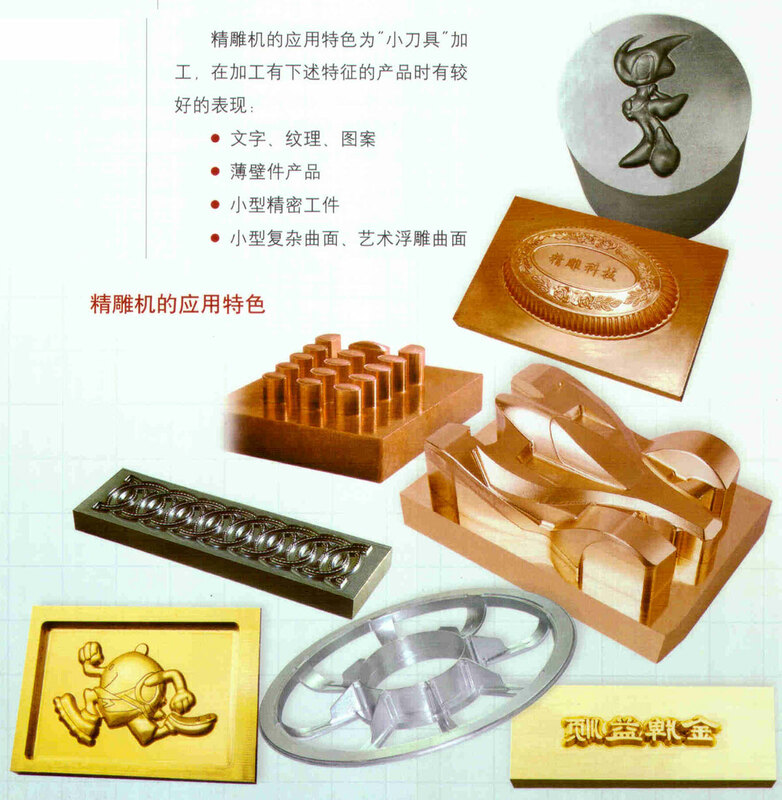 Industry prototypes electric iron mould which is made from CNC engraving machines. 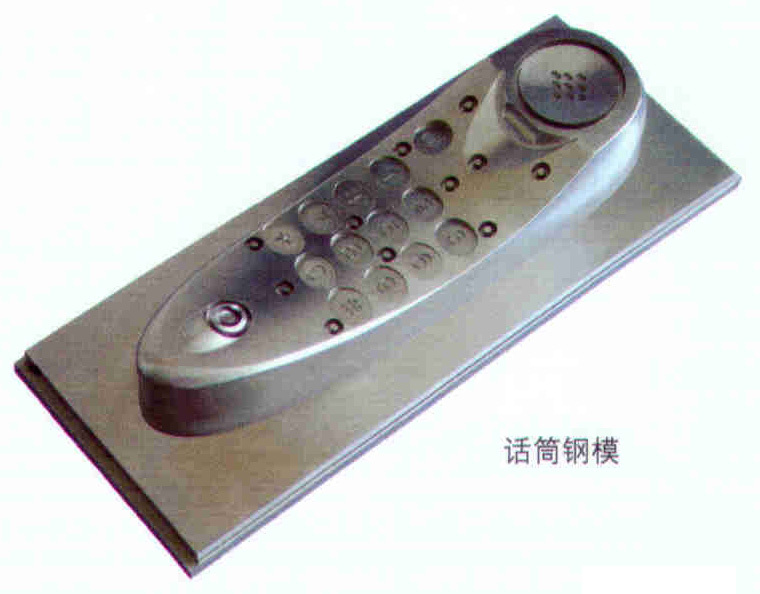 Industry prototypes aluminium hand panel mould which is made from CNC engraving machines. Finger ring which is made from CNC engraving machines. 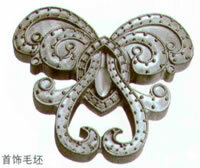 Jewelry roughcast which is made from CNC engraving machines. 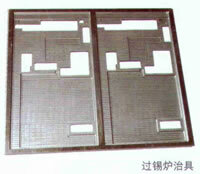 High frequency mould which is made from CNC engraving machines. Artware which is made from CNC engraving machines. Photoes frame empaistic flowers which is made from CNC engraving machines. 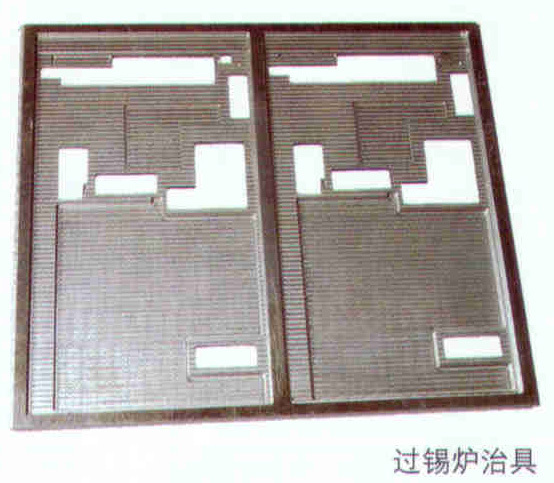 Press aluminography pannel which is made from CNC engraving machines.